The Marriott Hotel in Islamabad, Pakistan, aflame after being bombed in September 2008. The War in North-West Pakistan is an armed conflict between the United States, Pakistan, and the armed militant groups such as the TTP, LeI, TNSM, al–Qaeda, regional armed movements, and elements of organized crime. The armed conflict began in 2004 when tensions, rooted in the Pakistan Army's search for al-Qaeda fighters in Pakistan's mountainous Waziristan area (in the Federally Administered Tribal Areas), escalated into armed resistance. Pakistan's actions were presented as its contribution to the international War on Terror. Clashes further erupted between unified Pakistan Armed Forces and the Central Asian militant groups, allied with the Arab fighters, in 2008–10. The foreign militants were joined by Pakistani non-military veterans of the Afghan war in West which subsequently established the TTP and other militant umbrella organizations such as LeI. The TNSM established in 1992 allied with the TTP and LeI. The war depleted the country's manpower resources and its outcomes outlined a deep effect on its national economy since it Pakistan had joined the U.S-led on War on Terror. According to the Ministry of Finance (MoF) statistics and mathematical data survey collections, the economy has suffered direct and indirect losses of up to ~$67.93 billion since 2001 due to its role as a "frontline state." According to the MoF issued Pakistan Economic Survey 2010-11, pointed out that "Pakistan has never witnessed such a devastating social and economic upheaval in its industry, even after dismemberment of the country by a direct war with India in 1971." Various names have been applied to the conflict by the authors and historians. War in North-West Pakistan is the most commonly used name in English. It has also been called the Waziristan War, and the War in Waziristan. On the other hand, political scientist, Farrukh Saleem, termed the war as "Fourth Generation War" or "4G War". In the aftermath of Battle of Tora Bora (lit. Black Caves), formal troop deployment was begun by the Pakistan Army, at the behest of the Pakistan Government, in 2002. The conservative parties, most notable the Pakistan Muslim League, was very critical of such troop deployments in the region. The XI Corps, under its commander Lieutenant-General Jan Aurkzai, entered the Tirah Valley in the Khyber Agency for the first time since Pakistan's independence in 1947. The army troops later moved into the Shawal Valley of North Waziristan, and eventually entering in the South Waziristan. A monitoring reconnaissance base was established by the Special Service Group [Navy] in 2003. Criticism on Musharraf and the United States grew in Peshawar by a massive communist party in 2003, demanding to end the operations. In 2004, the troubles mounted as the Tribes began to see military's deployment and repeated PAF's flights in the region as an act of subjugation. In 2003–04 public speeches, Musharraf had repeatedly been calling to evicted out the foreign fighters from the South Waziristan and had justified the army deployments in the region despite the concerns. In December 2003, at least two assassination attempts against President Pervez Musharraf were traced to South Waziristan. The government responded by intensifying military pressure on the area, however the fighting was costly and government forces sustained heavy casualties throughout 2004 and into early 2005 when the government switched to a tactic of negotiation instead of direct conflict. Military Intelligence map: In 2004, the military action took place to remove the terrorist elements when many foreign fighters found sanctuary after escaping from Tora Bora (lit. Black Caves) of Afghanistan, via Safed Koh range, to Wana of Pakistan. On 16 March 2004, a bloody mountainous battle between the Pakistan Army troops and the foreign fighters of al-Qaeda was fought in the white mountains of the South Waziristan. The Pakistani media speculated that Pakistan Army had surrounded a "high value target" in the mountainous region, possibly al-Qaeda's then-second-in-command Ayman al-Zawahiri. According to the military intelligence in 2004, all militants were Chechens, Uzbeks, and Tajiks who were trying to flee Black Caves (Tora Bora of Afghanistan). After a week of the battle, the entire area was captured by Pakistan Army, as much as 400 al-Qaeda operatives were apprehended by the Pakistan Army. In spite of its success, the army failed to capture Zawahiri or he was never among between in them; the ISPR later admitted that it was Soviet Uzbek Tohir Yo‘ldosh who was surrounded, not Zawahiri. By 2004, additional battalions were stationed by General Musharraf to help curb infiltration into Pakistan through its porous border. The Military Intelligence, Covert Action Division (CAD) and army troops founds many caves and tunnels in White Mountain range used by the foreign fighters before the military action took place. The Military Intelligence accounts maintained that the tunnels were led into Afghanistan, possible Tora Bora region. Though it is difficult to know how effective the cordon was on the first night of the military suspension but the military intelligence accounts did confirmed that many high-value foreign fighters might have escaped through these tunnels and caves back to Afghanistan. On 7 October 2004, Musharraf approved the appointment of his close aide, General Ehsan-ul-Haq from ISI, who superseded seven colleagues; his appointment was brutally criticized by the media. After becoming the chairman joint chiefs, General Ehsan-ul-Haq oversaw the ground troops deployment of army only, while the air force and navy were kept out of the region. In April 2004, the Government of Pakistan signed the first of three peace agreements with militants in South Waziristan. It was signed by militia commander Nek Muhammad Wazir, but was immediately abrogated once Nek Muhammad was killed by an American Hellfire missile in June 2004. The second was signed in February 2005 with Nek's successor Baitullah Mehsud, which brought relative calm in the South Waziristan region. This deal would later, in September 2006, be mimicked in the neighboring North Waziristan territory as the third and final truce between the government and the militants. However, all of these truces would not have a substantial effect in reducing bloodshed. The latter two deals were officially broken in August 2007 with the Operation Silence was initiated in Islamabad, which saw a tenfold increase in suicide attacks on Pakistan Armed Forces. Strategy of keeping the air force and navy out from the conflict proved to be wrong as the violence spread out all over the country, and the army was increasingly in great pressure from the militants in 2004-07. In 2007, General Ehsan-ul-Haq admitted publicly that keeping navy and air force out of the conflict was wrong. Air Intelligence map: Map showing the air domain of the districts of the Tribal areas (FATA) and the North-West Frontier Province (NWFP) of Pakistan. The ISI's Covert Action Division (CAD) and the Special Services Group conducted a secret paramilitary operation to capture a high ranking al-Qaeda operative Abu Faraj al-Libbi on 4 May 2005, after a raid outside the town of Mardan, 30 miles (48 km) northeast of Peshawar. His arrest was confirmed by the Government sources and noted as "al-Libbi was a high ranking al-Qaeda official, rumored to be third after Osama bin Laden and Ayman al-Zawahiri." Al-Libbi replaced Khalid Shaikh Mohammed after his arrest in March 2003 in connection with the September 11 attacks. The Pakistan government arrested al-Libbi and held him on charges in relation to being a chief planner in two assassination attempts on the life of President Pervez Musharraf in December 2003. On January 13, 2006, the United States Air Force launched an airstrike on the village of Damadola. The attack occurred in the Bajaur tribal area, about 7 km (4.3 mi) from the Afghan border, and killed at least 18 people. The attack again targeted Ayman al-Zawahiri, but later evidence suggests he was not there. On June 21, 2006, pro-Tehrik-i-Taliban Pakistan militants in the Bannu region of North Waziristan stated they shot down a Bell military helicopter that was reported to have crashed. The government denied missile fire as the cause, stating it was due to technical faults. The helicopter had taken off from a base camp in Bannu at around 7 am for Miramshah and crashed 15 minutes later into the Baran Dam in the Mohmandkhel area on Wednesday morning. Four soldiers were killed while three others were rescued. On the same day militants killed an inspector and two constables on a road connecting Bannu and the main town of Miranshah. On June 21, 2006, Afghan Taliban leader Sirajuddin Haqqani issued a decree that it was not (Afghan) Taliban policy to fight the Pakistan Army. However, the Tehrik-i-Taliban Pakistan intentionally did not circulate the decree in North Waziristan thereby keeping pressure on the government. Intelligence map: Navy intelligence maps shows the districts of the FATA in blue and NWFP in green. The Pakistan military will help reconstruct infrastructure in tribal areas of North and South Waziristan. The Pakistan military will not tolerate any assistance to intruders in North Waziristan, and will monitor actions in the region. The Pakistan government is to compensate tribal leaders for the loss of life and property of innocent tribesmen. "Foreigners" (informally understood to be foreign jihadists) are not allowed to use Pakistani territory for any terrorist activity anywhere in the world. 2,500 foreigners who were originally held on suspicion of having links to the Taliban were to be detained for necessary action against them. The agreement, dubbed the Waziristan accord, has been viewed by some political commentators as a success for Pakistan. Even the military commander of the Pakistan Army, Lieutenant-General Ali Jan Aurakzai, also welcomed the peace agreement as "unprecedented in tribal history" and credited the inter-tribal jirga with amicably resolving a complicated issue within a few weeks. Others were far more critical, seeing it as allowing militants to regroup and reorganize after military operations. However in 2007, accord's chief architect and chairman joint chiefs General Ehsan-ul-Haq openly admitted to the media that the only ground troops deployment was wrong as the "Waziristan truce went wrong". The media reported a deadly missile airstrike conducted against a Monastry in the Bajaur region bordering Afghanistan by a "fixed-wing drone" aircraft, based on the testimonies of the locals on 30 October 2006. Immediately, the ISPR claimed that the operation was only by the Pakistan Army, not by the U.S. Army. The monastery was destroyed killing up to 82 people; the ISPR quickly claimed that all were the militants and denied that there had been any collateral damage. The defense expert and others, however, remain skeptical of ISPR statements and gave credibility to local's testimonies. In retaliation for the attack the militants unsuccessfully fired series of RPG rockets on heavily fortified security camp of Khyber Pakhtunkhwa and Lieutenant-General Jan Aurkzai; though his convey escaped unharmed on 8 November 2006. The same day, the militants coordinated a successful suicide bomb attack on military base in Dargai, about 100 km north of Peshawar. The suicide attack killed nearly 42 Pakistani soldiers and wounding 20 others. Military intelligence investigators later testified in media that suicide bombing had a direct link with the air strike. As early as 2007, the Northern region had been suffering with an intense insurgency and President Musharraf was increasingly in great pressure from the militants when several of army operations outlined mixed results. In March, his government was forced to signed a peace treaty with Fakir Mohamad, the main militant leader in Bajaur. Militant groups now held three districts in the Federally Administered Tribal Areas: South Waziristan, North Waziristan and Bajaur Agency. In South Waziristan, the Uzbek militancy had been growing as many former Soviet fighters–turned militants were reportedly seen encircling in the area; many of the military intelligence reports indicated the movements of former Soviet fighters in the region, mostly Uzbeks and Chechens from the troubled areas of Russian Federation. In 2007, the fighting sparked between the Uzbek fighters and the native militant groups by the killing of Arab fighter, Saiful Adil, an al-Qaeda operative, blamed on the Uzbeks fighters by Maulvi Nazir, described as a top pro-Taliban militant commander in the region. According to the other version, the fighting started after Maulvi Nazir, whom the government claimed had come over to its side, ordered the Uzbek followers of former Soviet fighters, Tohir Abduhalilovich Yo'ldoshev and Kamolitdinich Jalolov, to disarm, both were formerly the close confidants of Osama bin Laden. It was also preceded by the clashes between the Yo'ldoshev led IMU and a pro-government tribal leader in Azam Warsak, in which 17–19 people died before a ceasefire was announced. Military Intelligence map: In 2007, the Uzbek IMU dominated the South Waziristan before forced out from the country by tribes and the armed forces in 2008. According to the military intelligence officials in 2007, there were many key reasons why the Uzbeks had been dominating the area. Military intelligence reports testified that the locals were scared to mobilize the opposition against the Uzbek militants due to their reputations as fierce fighters with long memories and very strong military backgrounds. Some of them were used to be the soldiers and the officers in the Soviet Army during the Russian invasion of Afghanistan in the 1980s, and some of them had military trainings given by the CIA during the 1990s; hence they were experts in guerrilla warfare. The IMU fighters had little to lose and it was difficult for them to escape somewhere else. They couldn’t go back to Uzbekistan, and after 2009, re-infiltration back to Afghanistan also started getting more difficult. Thus, they made the Waziristan their home. Local militants allied to the tribesmen were reported attacking and seizing the IMU's private jail in Azam Warsak. The Pakistan Army intelligence said it did not intend to step in, but witnesses say government artillery fired on the Uzbek fighters they set up to fight the tribesmen. Heavy fighting resumed on March 29, 2007, ending a week-long ceasefire between tribal fighters and foreign militants. According to initial reports, tribesmen attacked a checkpoint manned by former Soviet Uzbek fighters and captured two of them. The clashes also left one tribal fighter dead and three wounded. The following day, a senior Pakistani official announced that 52 people were killed during the past two days, 45 of them were Uzbeks and the rest tribesmen. One of Maulvi Nazir's aides put the death toll at 35 Uzbeks fighters and 10 tribal fighters. However, residents in the area said that the death toll on both sides was inflated. The conflict further escalated on April 2 when a council of elders declared jihad against foreign militants and started to raise an army of tribesmen. According to Pakistani intelligence officials, heavy fighting concentrated in the village of Doza Ghundai left more than 60 people dead, including 50 foreigners, 10 tribal fighters and one Pakistani soldier. Intelligence officials also said that "dozens of Uzbeks" had surrendered to tribal forces and that many bunkers used by militants were seized or destroyed. On 12 April 2007, the army general in charge of South Waziristan said that tribal fighters had cleared the Soviet Uzbeks out of the valleys surrounding Wana and the foreign fighters had been pushed back into the mountains on the Afghan border. Four days later, the local tribesmen has urged Islamabad to resume control of law and order in the area. The siege of Red Mosque was one the serious breach in the conflict and escalated the conflict in the summer of 2007. On July 3, 2007, the militant supporters of Lal Masjid and the Pakistan police clashed in Islamabad after the students from the mosque attacked and stoned the nearby MoE secretariat. Their resultant faceoff with the military escalated, despite the intervention of then-ruling PML(Q) leaders Shuja'at Hussain and Ijaz-ul-Haq. The Pakistan police, aided by the Pakistan Army Rangers immediately put up a siege around the mosque complex which lasted until July 11 and resulted in 108 deaths. This represented the main catalyst for the conflict and eventual breakdown of the truce that existed between Pakistan and the Taliban groups. Already during the siege, there were several attacks in Waziristan in retaliation for the siege. As the siege in Islamabad ensued, several attacks on Pakistan army troops in Waziristan were reported. First attack was reported on 14 July 2007 when a suicide bomber attacked a Pakistan Army convoy killing 25 soldiers and wounding 54. Second attack was on 15 July 2007, two suicide bombers attacked another Pakistan Army convoy killing 16 soldiers and 5 civilians and wounding another 47 people. And in a separate incident, a fourth suicide bomber attacked a police headquarters killing 28 police officers and recruits and wounding 35 people. The assault on the Red Mosque prompted Islamic militants along the border with Afghanistan to scrap the controversial Waziristan Accord with Musharraf. Pakistan airborne forces captured the highest point in Swat valley, 2009. Under pressured, Musharraf moved the army in large concentration of troops into Waziristan and engaged in fierce clashes with militants in which at least 100 militants were killed including wanted terrorist and former Guantanamo Bay detainee, Abdullah Mehsud. The militants also struck back by attacking Army convoys, security check points and sending suicide bombers killing dozens of soldiers and police and over 100 civilians. In one month of fighting during the period from July 24 to August 24, 2007, 250 militants and 60 soldiers were killed. On 2 September 2007, just a few dozen militants led by Baitullah Mehsud managed to ambush a 17-vehicle army convoy and captured an estimated 247 soldiers without a shot being fired, an event that shocked the nation. Several officers were among the captured, the public criticism grew hard on Musharraf. After the army returned to Waziristan, they garrisoned the areas and set up check-points, but the militants hit hard. In mid-September, the TTP and other forces attacked a number of Pakistan army outposts all across North and South Waziristan. This resulted in some of the heaviest fighting of the war. Following the Lal Masjid Siege, the first outpost was attacked and overrun by the militants resulting in the capture of 12 Pakistani soldiers. The next day on 13 September 2007, a suicide bomber in Tarbela Ghazi attacked a Pakistan army base, destroying the main mess hall and killing 20 members of the SSG Karrar Commando Unit; Pakistan's most elite army unit. A series of attacks ensued and by 20 September 2007, a total of five Pakistan Army military outposts had been overrun and more than 25 soldiers captured. More than 65 soldiers were either killed or captured and almost 100 wounded. A little over two weeks later, the Army responded with helicopter gunships and ground troops. They hit militant positions near the town of Mir Ali. In heavy fighting over four days, 257 people were killed, including 175 militants, 47 soldiers and 35 civilians. A soldier of Pakistan army in combat position. By the end of October 2007, another heavy fighting erupted in the Swat district of the Khyber Pakhtunkhwa Province between the Frontier Police and the large portion of far right-wing TNSM organization, under the command of Maulana Fazlullah who was trying to impose Sharia law. In a response, the military deployed a combat brigade under a local Brigadier-General to confront them. After week of heavy fighting with the brigade combat teams, the battle came to a standstill with both sides suffering heavy casualties. On 3 November 2007, around ~220 paramilitary soldiers and policemen surrendered or deserted after a military position on a hill-top and two police stations were overrun. This left the TNSM in control of most of the Swat district. The fighting in Swat is the first serious insurgent threat from terrorist groups in what is known as a settled area of Pakistan. Following this, foreign fighters of al-Qaeda loyal to TNSM's Maulana Fazlullah tried to implement strict Islamic law in November 2007. In November 2007, another brigade combat team was deployed with the help of helicopter gunships to crush the uprising. By the beginning of December 2007, the fighting had ended and the military recaptured Swat. Almost ~400 foreign fighters of Maulana Fazlullah were dead along with 15 Pakistani soldiers and 20 civilians in the military suspension. Despite the victory by the military, the foreign fighters of TNSM slowly re-entered Swat over the coming months and started engaging security forces in battles that lasted throughout 2008. By early February 2009, the whole district was in military control. On September 3, 2007, the two coordinated suicide bombers targeted a ISI bus and a line of cars carrying ISI officers. The bus attack killed a large number of Defence Ministry workers and the other attack killed an Army colonel. In all 31 people, 19 soldiers and 12 civilians, were killed. Two months later on November 24, another military intelligence (MI) bus was again attacked. Almost everyone on the bus was killed. Another bomber blew up at a military checkpoint. 35 people were killed, almost all military officials. Facing with an intense criticism from media regarding the Red Mosque siege, President Musharraf became involved in a confrontation with the country's judiciary who began taking suo motu actions against the directives issued by Musharraf and his Prime Minister Shaukat Aziz on issues involving the forming of the investigative commission on Red Mosque as well as hearings of victims of the siege, the findings of missing persons, issuing verdicts against the controversial NRO and privatization, and issuing subpoena regarding the extrajudicial killing of Baloch nationalist, Akbar Bugti, in 2006. Failing to reach a compromise and subdue the judiciary, Musharraf authorized the decree of sacking around ~70 senior justices including, the Chief Justice Iftikhar Chaudhry, immediately and declared the state of emergency on 9 November 2007. Virtually suspending the supreme law of the land, the constitution of the country, the massive nation-wide demonstration and anger erupted against President Musharraf. Though, this action and its responses are generally related to the controversies surrounding the re-election of Musharraf during the presidential election that had occurred on 6 October 2007, and also was claimed by the government to be the reaction to the actions by militants in Waziristan. On 27 December 2007, Pakistani opposition leader and former Prime Minister Benazir Bhutto was assassinated upon leaving a political rally for the Pakistan Peoples Party (PPP) in Rawalpindi, Pakistan. A suicidal assassin reportedly fired shots in Bhutto's direction just prior to detonating an explosive pellet-laden vest, killing approximately 24 people and wounding many more. Ultimately, President General Musharraf and his military establishment blamed the attack on al-Qaida, but this was contradicted following day when Baitullah Mehsud sending a statement to the media saying that he and al-Qaida had "no involvement in the murder of the former Prime Minister", and that they believed that Musharraf was responsible. The violence spread all over the country and national media broadcast the wave of violence across the country that left 58 people dead, including four police officers. Most of the violence was directed at Musharraf and his political party, PML(Q). Opposition parties, notably the PPP, branded PML(Q) as "Qatil League" (lit. Murderer's League). Benazir Bhutto had previously survived an assassination attempt made on her life during her homecoming which left 139 people dead and hundreds wounded. In January 2008, the foreign fighters overran Sararogha Fort, and may have overrun a fort in Ladah as well. Both forts are in South Waziristan, and were held by the Pakistan Army. After the general elections in 2008, the army's fighting capability was depleted under the command of President Musharraf and many in the media had scrutinized the role of the army in the national politics. On 25 February 2008, a suicide bomber struck in the garrison-town of Rawalpindi which targeted and killed top military medic and Medical Corps Surgeon-General, Lieutenant-General Mushtaq Baig, along with two more soldiers and five civilians. In a secretive appointment by Musharraf personally, General Baig had been an operational commander of the army fighting in the region and was the highest-level military official to be assassinated since 1971 war. In 2008, General Musharraf was soon relieved off his command, succeeding General Ishfaq Pervez Kiani as chief of army staff. Events led by successful movement pushed Musharraf to downfall, followed by the consolidated impeachment movement led by Prime minister Yousaf Raza Gillani ousted Musharraf from the presidency in 2008. The new socialist government led by Prime minister Yousaf Raza Gillani of the PPP made critical decisions and appointment in the key combatant staff of the armed forces, including the new chief of naval staff (Admiral Noman Bashir) and endorsing air chief marshal Rao Soleman as chief of air staff; all in late 2008. The upcoming and then-newly appointed Chairman Joint Chiefs General Tariq Majid formalized a plan and strategy to tackle the insurgency. Terming as "tri-services framework (TSW)", the chairman joint chiefs emphasized the role of inter-services to tackle the insurgency with full force, and joint army-navy-airforce efforts that are synergized within a framework of jointness and inter-operability to meet present and future challenges". His plan was submitted to Prime minister Yousaf Raza Gillani who approved the new strategy, which followed the new order of battle and new deployments of combat units of joint army-navy-air force in the north-western region. After a brief intense change in chain of command in the Pakistan Armed Forces, a full-fledged military operation called 'Zalzala (lit. earthquake) was undertaken by 14th Army Division in January with the goal of flushing out Baitullah Mehsud's TTP fighters from the area. The area had previously been a more or less safe zone for militants, with some villagers providing them support and shelter. The operation resulted in tactical success and scores of militants were killed during the operation, and within three days the armed forces were in full control of the area. The army later captured a few other villages and small towns as part of their attempt to pressure Baitullah Mehsud. However, the operation led to a huge displacement of local population. According to the GOC of the 14th Army Division's Major-General Tariq Khan, about 200,000 men, women and children, were displaced. Khalid Aziz, former NWFP chief secretary and expert on tribal affairs, said the displacement was "one of the biggest in tribal history" adding that human cost of the conflict in Waziristan "has gone unrecorded." The locally built JF-17s were put on combat test in the South Waziristan offense. Earlier on 7 February 2008, the TTP had offered a truce to Musharraf and peace negotiations resulting in a suspension of violence. On 21 May 2008, the Government signed a peace agreement with the Tehrik-i-Taliban Pakistan (TTP). Despite the agreement sporadic fighting continued until late June and escalated with the takeover of the town of Jandola on June 24, by the militants. Around 22 pro-government tribal fighters were captured and executed by the TTP at that time. On 28 June 2008, Pakistan Army started another offensive against militia fighters in Kyhber, codenamed Sirat-e-Mustaqeem (lit. Righteous Path). The military took control of a key town and demolished an insurgent group's building. In this offense, one militant was reportedly killed while two soldiers died in Swat valley. The operation was halted in early July. On 19 July 2008, clashes erupted between the TTP and a faction of pro-government Taliban militants. The fighting ended with 10–15 of the pro-government fighters were killed and another 120 were captured. Among the captured were two commanders who were tried under "Islamic" law by the Taliban and then executed. On 21 July 2008, heavy fighting with the another separatist group, the BLA in Baluchistan Province, killed 32 militants, 9 soldiers and 2 civilians. More than two dozen militants were captured and a large weapons cache was found. Between 28 July and 4 August 2008, heavy fighting flared up in the northwestern Swat valley leaving 94 militants, 28 civilians and 22 soldiers and policemen, were dead. On 6 August 2008, the heavy ground fighting erupted in the Loisam area of the Bajaur district. The Loisam lies on the strategically important road leading towards the main northwestern city of Peshawar. The fighting started when hundreds of foreign fighters poured into the area and began attacking armed forces. After four days of fighting on 10 August 2008, the military forced to withdrew from the area. It resulted in confirmed killing of 100 militants and 9 soldiers, and another 55 soldiers were missing, at least three dozen of them captured by the militants. While the fighting was going on in Bajaur, in the Buner area of Khyber Pakhtunkhwa Province, the militants killed at least nine policemen in an attack on a check post. The checkpoint was then abandoned, and the army troops withdrew to Khar, the main town of Bajaur Agency. There were reports that the town of Khar was then besieged by tribal militants. On 21 August 2008, in response to the military offensive in Bajaur, two suicide bombers attacked the POF Laboratories in Wah while workers were changing shifts. The attack killed at least 70 people. As military retreat from Bajaur Agency, the Pakistani tribal elders began organizing a private army of approximately 30,000 tribesmen to fight the TTP, with the support of the Provincial government on September 2008. This local private military company known as 'lashkar' (lit. Brigade), had composed of Pakistani tribesmen who began burning the houses of militant commanders in Bajaur and vowed to fight them until they are expelled. During this campaign, the Lashkar torched the house of local militant commander named Naimatullah, who had occupied several government schools and converted them into seminaries. A tribal elder named Malik Munsib Khan quoted in media that tribes would continue their struggle until the foreign fighters were expelled from the area, adding that anyone found sheltering militants would be fined one million rupees and their houses will be burned. The tribesmen also torched two important centres of the militant activity in the area and gained control tribal areas. One of the main motivations for this activity was the operations that were taking place in the FATA that had displaced some 300,000 people while dozens of citizens had been killed in clashes between the militants and military. Since the start of operations against the foreign fighters, some 150,000 tribesmen have sided with them. The American military proposals outlined an intensified effort to enlist tribal leaders in the frontier areas of Pakistan in the fight against al-Qaeda. The proposal was modeled in part on a similar effort by American forces in Iraq that had been hailed as a great success in fighting foreign insurgents there. But it raised the question of whether such partnerships can be forged without a significant American military presence in Pakistan. The American military raised great questions whether it is enough support can be found among the tribes. Small numbers of high-ranking officers of American military have served as advisers to the Pakistan Armed Forces in the tribal areas, giving planning advice and helping to integrate American intelligence. Under this new approach, the number of advisers had to increase. The US Government said these security improvements complemented a package of assistance from the US AID for the seven districts of the tribal areas that amounted to $750 million over five years, and would involve work in education, health and other sectors. The BINLEA of the US Government also assisted the Frontier Corps with financing for counter-narcotics work. In 2008, the al-Qaeda strike its largest terrorist attack in Islamabad when a truck bomb targeted the Marriott Hotel. This attack was a defining moment in the war and around ~266 sustained the injuries and 54 died. According the testimonies, numbers of U.S. Marines soldiers and U.S. Navy personnel also died in the attack; many believed the Americans were the target of the terrorist attacks. In a response to attack on 23 September 2008, the PAF launched its aerial bombing mission which resulted in ultimate success. Military reports indicating that more than 60 insurgents were killed in northwest Pakistan. In the nearby Bajur tribal region, the air force strikes killed at least 10 militants, according to government officials. The Bajur operations, which the army said left more than 700 suspected militants dead, won praise from U.S. officials. In a television emergency address, President Zardari and Prime Minister Gillani publicly vowed revenge in response to the Marriott Hotel bombing. By 26 September 2008, Pakistan air force and army had successfully conducted and completed a major joint offensive in the Bajaur and the Tang Khata regions of the Federally Administered Tribal Areas, codenamed Operation Sherdil. Thist joint operation had killed over 1,000 militants in a huge offensive, a day after President Asif Ali Zardari lashed out at US forces over a clash on the Afghan border. Major-General Tariq Khan, now Inspector General of the Frontier Corps, mentioned to journalists that since the beginning of the Bajaur operations, there were up to 2,000 militant fighters including hundreds of foreign fighters who were fighting with the soldiers and the armed forces. The overall death toll was over ~1,000 militants and also adding that 27 Pakistani soldiers had also been killed with 111 soldiers seriously wounded. In this major aerial offense, five of the most wanted al-Qaeda operatives and Central Asian militant commanders were among those killed in a month-long operation in Bajaur. According to PAF reports, "out of the five militant commanders killed, four appeared to be foreigners: Egyptian abu Saeed Al-Masri; Abu Suleiman, also an Arab; an Uzbek fighter named Mullah Mansoor; and an Afghan commander called Manaras. The fifth was a Pakistani commander named only Abdullah, a son of aging hardline leader Maulvi Faqir Mohammad who is based in Bajaur and has close ties to Al-Qaeda second-in-command Ayman al-Zawahiri. Between October 22 and October 24, the armed forces engaged in another hard-push against militants in the restive Bajaur and Khyber tribal regions. The army troops did not enter in the region until the PAF conducted its precision bombings. The PAF intense high-altitude air strikes missions were carried out in the Nawagai and Mamond sub-districts of Bajaur Agency. The advancing troops destroyed several centers of militants at Charmang, Chinar and Zorbandar and inflicted heavy losses on them. The army gunship helicopters shelled in Charming, Cheenar, Kohiand Babarha areas of Nawagai and Mamund Tehsil of Bajaur agency, destroying various underground hideouts and bunkers of militants. The armed forces also took control of different areas of Loisam, a militant headquarters, and advanced towards other areas for complete control. An MQ-9 taking off in Afghanistan. At the end of August 2008, the USAF stepped up its air attacks in the Federally Administered Tribal Areas. On 3 September 2008, the United States Army Special Forces teams laid a commando attack in a village near the Afghan border in South Waziristan. Additional air strikes from unmanned drones in North Waziristan culminating on 8 September 2008, when a United States Air Force drone aircraft fired a number of missiles at a "guest house for militants arriving in North Waziristan." Around ~23 people were killed, but the operations target, Jalaluddin Haqqani, was not among them. On 25 September 2008, the Pakistan military and the US military began involved in heavy border fighting on the Frontier border. The incident happened after two US military helicopters came under fire from the Pakistan army troops. A US military spokesman insisted that they had been about a mile and a half inside Afghanistan. Speaking at the United Nations, President Asif Zardari maintained that Pakistan would not tolerate violations of its sovereignty, even by its allies. President Zardari told the United Nations, "Just as we will not let Pakistani's territory to be used by terrorists for attacks against our people and our neighbours, we cannot allow our territory and our sovereignty to be violated by our friends," he said, without specifically citing the United States or the border flareup. On October 10, 2008, TTP militants beheaded four kidnapped pro-government tribal elders in the Charmang area of Bajaur. On October 11, 2008, a suicide bomber struck an anti-militant gathering of tribal elders just as they had decided to form a lashkar (tribal militia). At least 110 anti-Taliban tribesmen were killed and a further 125 were wounded. The suicide bomber drove his car into the gathering itself and blew himself up. The attack on the tribal council took place in Orakzai, normally a relatively quiet corner of the nation's chaotic tribal areas. The PAF's F-16s took active participation in the combat aerial bombing missions against the TTP hideouts. Most PAF combat air operations were conducted at night. On 19 October 2008, the news media began to broadcast the news of Pakistan Army troops, led by an army lieutenant, being locked in a fierce battle with foreign militants to keep open the line routes to NATO forces in Afghanistan. For several months, the foreign militants had been trying to either attack or seal off the supply routes. The army battle reports indicated that the local commander, Mohammad Tariq al-Fridi, had seized terrain around the mile-long Kohat Tunnel. The military intelligence reports had held al-Fridi responsible for coordinated suicide bomb attacks and rocket strikes against convoys emerging from it. The TTP spokesman, Maulvi Omar, claimed that his foreign fighters would lay down their arms if the Pakistan Army ceased intense fighting. The military refused his offers and a tactical military operation was launched to secure the tunnel routes after TTP seized five trucks carrying weapons and ammunition. They held the tunnel for a week before they were driven out in fierce fighting with the military. Since then, Tariq and his men have returned several times to attack convoys, in a response, the army launched its latest onslaught after a suicide bomb attack at one of its bases near the tunnel six weeks ago. In a massive manhunt operation, Tariq was killed along with hundreds of militants while trying to flee the battle in a combat air operation. The operation ended with five civilians were killed and 45 were injured, including 35 soldiers, when a pickup truck packed with explosives was driven into a checkpoint. On 11 November 2008, another group of militants attacked two convoys at the Khyber Pass capturing 13 trucks which were headed for Afghanistan. One convoy was from the United Nations World Food Programme and was carrying wheat. The second was intended for NATO troops and one of the captured trucks was carrying with it two U.S. military Humvees, which were also seized. On 8 December 2008, the militants torched more than 160 vehicles destined for US-led troops in Afghanistan. The militants attacked the Portward Logistic Terminal (PTL) in the northern city of Peshawar at around 02:30 am, destroying its gate with a rocket-propelled grenade and shooting dead a guard. They then set fire to about 100 vehicles, including 70 Humvees, which shipping documents showed were being shipped to the US-led coalition forces and the Afghan National Army. At the same time, militants torched about 60 more vehicles at the nearby Faisal depot, which like Portward is on the ring road around Peshawar, where convoys typically stop before heading for the Khyber Pass. On 3 February 2009, the militant group again blew up a bridge at the Khyber Pass, temporarily cutting a major supply line for Western troops in Afghanistan. After the attack supplies along the route had been halted "for the time being", according to NATO. Pakistan's airborne troops performed combat jump operations from PAF's C-130 Hercules aircraft, 2010. Since 2008–09, the Chairman joint chiefs General Tariq Majid, working with his JS HQ staffers, had been running several meetings of planning to conduct the joint warfare operations against the TTP militants. A new strategy of joint-military operations and studies were conducted under General Majid. During this time, the Government agreed to impose the Sharia ordnance law and temporarily suspended the military suspension in the Swat Valley in Khyber Pakhtunkhwa Province. This decision was troubling for the United States in Afghanistan, which believed that it would embolden militant groups fighting US military–led ISAF in Afghanistan. The US government also believed it would provide another safe haven for the militants within 80 miles (130 km) of Islamabad, as well as a corridor between the North–Western border with Afghanistan and North–Eastern border with India. The Pakistan Government officials rationalized that "such agreement was the only way to pacify a fierce insurgency and avoid more civilian casualties in Swat Valley – whose ski resort and mountain scenery once made it a popular tourist destination. The Khyber Pakhtunkhwa's Chief Minister, Amir Hoti, announced that the local authorities would impose Islamic law across Malakand Division, which includes Swat. The Government officials maintained that President Asif Zardari would sign off on the deal once peace had been restored. However, the agreement was never signed by President Zardari soon after the TTP militants violated the treaty. The agreement came the day after the militants in Swat said that it would observe a ten-day ceasefire in support of the peace process. Pakistani officials say that the laws allow Muslim clerics to advise judges, but not to outlaw female education, music or other activities once banned by the Afghan Taliban in Afghanistan. On 1 March 2009, the Pakistan Army troops finally defeated the foreign fighters in Bajaur, which is a strategically important region on the Afghan border. The 40th Army Division commander, Major-General Tariq Khan reported that the army and the Frontier Corps had killed most militants in Bajaur, the smallest of the agencies but a major infiltration route into Afghanistan, after a six-month offensive. By the time the battle in Bajaur was over, the Pakistan Army killed over 1,500 militants while losing 97 of their own soldiers and 404 soldiers seriously injured. In retaliation on 30 March, the militant groups attacked the Police Academy in Munawan town, killing and taking hostage police cadets. In an operation led by Punjab Police, the units of Elite Police had managed to retake the academy. Lasting about eight hours, the police suspension ended with 18 people killed in the attack, including eight policemen, eight militants and two civilians deaths. At least, ~95 policemen were wounded and four gunmen were captured by the Elite Police. In a similar attack on 4 April 2009, another suicide bomber attacked a military camp in Islamabad killing eight soldiers; less than 24 hours later, two more suicide attacks occurred. One bomber targeted a market on the border with Afghanistan killing 17 people and the other attacked a mosque in Chakwal, in the Eastern Pakistan province of Punjab, killing 26 more civilians. The next day, the leader of the Tehrik-i-Taliban Pakistan, Baitullah Mehsud, promised that there were to be two suicide attacks per week in the country until the Pakistani army withdrew from the border region and the United States stopped its missile attacks by unmaned drones on militant bases. The PAF's precision bombing operations played crucial role in defeating of TTP from Swat in 2009. In March 2009, many Pakistanis were horrified when a videotape was broadcast in news channels that showed militant enforcers were publicly whipping a 17-year old girl in Swat accused of having an affair. The girl had not committed fornication or adultery but was flogged simply because she refused her brother's demand to marry someone of his choosing. Protests against the TTP broke out all over the country to demonstrate against the flogging. The conservative thinker, Raja Zafar-ul-Haq of Pakistan Muslim League, appearing in news channels, maintained that "this summary punishment of flogging simply for refusing a marriage proposal was totally un-Islamic and had nothing to do with Sharia." He went on to say that Prophet [Muhammad] had strictly forbidden the practice of forced marriages and in this case, the girl had not done anything wrong by refusing a marriage proposal. Sensing the sensitivity of the issue, the Supreme Court of Pakistan appointed a five-member team appointed to investigate the video's origins, and concluded that it had been faked, raising questions at Pakistani intelligence services. In Buner, the TTP continued their criminal activities when residents said TTP fighters had been stealing cattle for meat, stealing other livestock, berating men without beards and recruiting teenagers into their ranks. The TTP also began to steal vehicles belonging to government officials and ransacked the offices of some local non-government organisations for no apparent reason. 12 schoolchildren were killed by a bomb contained in a football. Pakistan airborne forces observing the Swat Valley at its highest point after defeating the Taliban, 2009. On 26 April 2009, the unified Pakistan Armed Forces started the strategic and tactical airborne attack, codename Black Thunderstorm, with the aim of retaking Buner, Lower Dir, Swat and Shangla districts from the TTP. This joint army-navy- air force unified operation was well rehearsed and prepared. The fighter jets of Navy and air force began pounding the militant hideouts while army kept advancing in the militant hideouts. The combat fighter pilots of the navy and air force flew their aerial bombing mission together in high altitude at continuous 24 hour period, to avoid being hit from the anti-aircraft guns. During the initial stages of the unified operations, the ground troops and paratroopers performed combat HALO/HAHO techniques to hold the control of high strategic mountains and hills surrounding the Taliban-controlled cities. The operation largely cleared the Lower Dir district of militia forces by April 28 and Buner by 5 May 2009. The same day, the ground fighting in Swat was particularly fierce since the TTP threw away their insurgent tactics and the ground forces obtained the counter-insurgency tactics. By 14 May 2009, the military was only six kilometers south of Mingora, the milita-held capital city of Swat, and preparations for all-out street fighting were underway. On 23 May 2009, the battle for Mingora started and by May 27, approximately 70% of the city was cleared of militants. On May 30, the Pakistan military had taken back the city of Mingora from the TTP, calling it a significant victory in its offensive against the militants. However, some sporadic fighting was still continuing on the city's outskirts. In all, according to the military, 128 soldiers and more than ~1,475 militants were killed and 317 soldiers were wounded during operation Black Thunderstorm. ~95 soldiers and policemen were captured by the militants; all were rescued by the military. 114 foreign fighters were captured, including some local commanders. At least 23 of the militants killed were foreigners. Sporadic fighting throughout Swat continued up until mid-June. On June 14, the operation was declared over and the military had regained control of the region. Only small pockets of Taliban resistance remained and the military started mopping up operations. This led to a refugee crisis, and by August 22, 1.6 million of 2.3 million have returned home according to UN estimates. A vintage photo of South Wazristan's mountains, primary hideouts of TTP before being pushed to Eastern Afghanistan by the military in 2009. In the aftermath of the successful victory and recapture of the entire Swat valley, the Pakistan military began a massive army troop build-up along the southern and eastern borders of South Waziristan on 16 June 2009,. The military was now taking the fight to Mehsud's mountainous stronghold, ordering an expansion of its current offensive against TTP fighters in the Swat valley. On 17 June 2009, the Khyber Pakhtunkhwa of Khyber Pakhtunkhwa, Owais Ghani, denounced Baitullah Mehsud as "the root cause of all evils," and quoted that the government has called on the military to launch a "full-fledged" operation to eliminate Mehsud and his estimated 20,000 men. The Islamabad's decision to launch the offensive against Mehsud signaled a deepening of Pakistani resolve against the militants. The military had targeted the TTP leader on three separate occasions – in 2004, 2005 and 2008 – but walked away each time after signing peace deals with Mehsud. This time, the military also enjoyed the public support as a wave of terrorist attacks had swayed public sentiment against the Taliban. On 17 October 2009, the military launched another offense, called Rah-e-Nijat when the combat brigades and fighter jets launched a large-scale offensive in South Waziristan involving ~28,000 troops advancing across South Waziristan from three directions. Starting with air force strike and naval intelligence assessment on the TTP, the first town to fall to the military was Kotkai, the birthplace of the TTP leader, Hakimullah Mehsud, on October 19, 2009. However, the next day, the TTP re-took the town. Troops had thrust into Kotkai only to be hit by a determined counteroffensive that killed seven soldiers, including an army major, and wounded seven more. The military managed to take the town once again on October 24, after days of bombardments. On October 29, the town of Kaniguram, which was under the control of Uzbek fighters from the Islamic Movement of Uzbekistan, was surrounded. And on November 2, Kaniguram was taken. On 1 November 2009, the towns of Sararogha and Makin were surrounded, and fighting for Sararogha started on November 3. The fighting there lasted until November 17, when the town finally fell to the military. The same day, the town of Laddah was also captured by the military and street fighting commenced in Makin. Both Sararogha and Laddah were devastated in the fighting. By 21 November 2009, the ISPR reports showed that more than 570 foreign fighters and 76 soldiers had been killed in the offensive. On 12 December 2009, the Pakistan military declared victory in South Waziristan. As early as August 2009, the TTP leader, Baitullah Mehsud, was killed in a drone attack. This was later confirmed by captured chief spokesman Maulvi Umar. He was replaced by Hakimullah Mehsud. In early October 2009, the TTP started a string of bomb attacks in cities across Pakistan. The goal of the attacks was to show that the TTP militants were still a united fighting force following the death of their leader and to disrupt a planned military offensive into South Waziristan. Places targeted include the U.N. World Food Program offices in Islamabad a food store in Peshawar,; military headquarters in Rawalpindi; a market in Shangla,; the intelligence establishments in Lahore,; the police stations in Kohat and Peshawar; the Islamic center at the International Islamic University in Islamabad; and Air Science Laboratories (ASL) Complex in Kamra. The month of November ended with a car bombing of Meena Bazaar, Peshawar killing 118 civilians. Additionally, the month of November saw suicide bombings of the National Bank of Pakistan in Rawalpindi, a market in Charsadda, and six bombings in Peshawar including the regional headquarters of the ISI and the Judicial Complex. In 2013, the media reported that the mastermind of chain of attacks in 2009, Abdullah Umar, was brutalized and killed in a police encounter with Punjab Police in 2013. Media authorities identified Abdullah Umar as a law student of the International Islamic University and a son of army colonel. In an offensive in Bajaur by Frontier Corps, a militants' stronghold village Damadola was captured and cleared by February 6, 2010. Bajaur was declared conflict free zone by April 20. 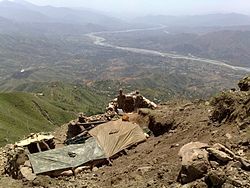 On March 23, 2010, the Pakistan armed forces launched an offensive to clear Orakzai. Officials also announced a future offensive in North Waziristan. The week prior the Pakistan military killed approximately 150 militants in fighting in the region. It was expected that all tribal areas would be cleared by June 2010. June 3, Pakistani authorities announced a victory over the insurgents in Orakzai and Kurram. 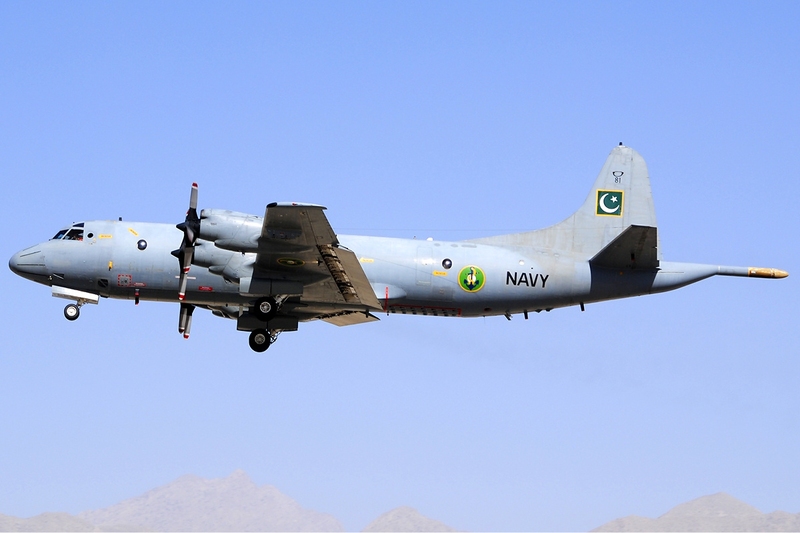 The Navy P-3C played significant role in managing signal intelligence operations against Taliban in the Waziristan war. Two of the four aircraft were destroyed during the PNS Mehran attack. As late as 2010, chief of naval staff Admiral Noman Bashir had coordinated many of successful tactical ground operations against TTP hideouts, to support the army and air force pressure on militants. Many successful operations were executed by the navy, and its operational capability gained international prominence. By 2011, Pakistan's armed forces were stretched thin by natural disasters and deployments against extremist groups, with one third of the army deployed for the fight, another third along the Indian border and the rest engaged in preparing to deploy. On 1 May 2011, in a clandestine operation in Abbottabad, al-Qaeda supremo Osama Bin Laden was raided and killed by the U.S. Navy SEALs in his private compound. The groups affiliated with the armed TTP vowed, via media, to avenge Osama's death upon the Pakistan Armed Forces. On April 21 and April 28, senior al-Qaeda operative Ilyas Kashmiri conducted a series of coordinated terrorist attacks on the Pakistan Navy presence in Northern and Southern contingents. This included attacks on high naval officials of the Pakistan Navy in Karachi, first attacking their bus near the Navy bases. Finally on May 22, TTP attacked the Mehran Naval Base, killing up to 10 naval officers, wounding 30 others, and destroying two reconnaissance naval aircraft, during their offensive. In response, the navy's SSG(N) launched its largest offensive efforts since the 1971 operations, and managed to control and secure the base after a massive shootout. Operationally resulting in tactical success, the navy's counter offensive killed all the militants and ring leaders behind these operations. Kashmiri was widely suspected in the Mehran operation. On 4 June 2011, Ilyas Kashmiri was killed by a U.S. drone strike in South Waziristan. In 2012, the north-west region of Pakistan experienced periodic bombings perpetrated by insurgents and resulting in thousands of deaths. On 22 December 2012, a suicide bomb attack carried out by the Pakistani Taliban killed Bashir Ahmed Bilour, a minister of Khyber Pakhtunkhwa, and 8 other people. In January 2013, at least 80 militants & civilians were killed in clashes between the Tehrik-e-Taliban / Lashkar-e-Islam and Ansar ul-Islam (a pro-government militant group) in Tirah Valley of Pakistan's Khyber Agency. Fighting between Ansar ul-Islam & the Pakistani Taliban continued till March and as a result, almost the entire Tirah Valley came under the control of Lashkar-e-Islam and TTP fighters. Over 250 militants & civilians were killed and 400 others wounded in the three-month-long clashes. The fighting also displaced about 200,000 to 300,000 people. This forced the Pakistan Army to start Operation Rah-e-Shahadat in order to root out insurgents & extremists from the strategically important region & restore peace & stability for the upcoming May elections. Military Intelligence map: Domain of Pakistan Armed Forces Operations to the areas adjacent to Afghanistan. Operation Rah-e-Shahadat (English: Path to Martyrdom; Urdu:راه شهادث), is a codename of an on-going joint military operation that was commenced on 5 April 2013 by the Pakistan Army, with assistance provided by the PAF and Navy for air support. In close coordination with Local Peace Committee (Aman Lashkar), the army troops and special operations forces, aided by Frontier Corps, to flush out TTP and LeI militants from the Tirah Valley of the Khyber Agency. At least four Pakistani soldiers and 14 insurgents were killed while 5 soldiers were also wounded. In an major aerial operation, the PAF and navy fighter jets pounded hideouts of banned group LeI in and according to military intelligence reports, many militants escaped from the areas taking with them their injured fighters. On 7 April 2013 Pakistani military officials said that at least 30 Taliban-linked militants and 23 soldiers including commandos were killed during clashes in the Tirah Valley since April 5. Several Aman Lashkar members were also reported to be killed and wounded. Scores of insurgents and Pakistani troops were injured in the operation. On 8 April 2013 Pakistani military officials said that at least 30 Pakistani soldiers and 97 militants were killed during fierce fighting with Taliban linked-fighters in the Tirah Valley since April 5, the day when the operation began. On 9 April 2013, the ISPR confirmed that at least 23 soldiers and 110 insurgents were killed in the four-day fighting in the Tirah Valley of Khyber Agency. On 11 April 2013 at least 15 militants and one Pakistani soldier were killed during fighting in southern sector of Tirah Valley. The areas of Mada Khel and Tut Sar were cleared from militants. On 12 April 2013 nine Pakistani soldiers and seven insurgents were killed during clashes in Sipah area of Tirah Valley. The security forces took control of the areas of Sandana and Sheikhmal Khel in Sipah area. Three Lashkar-e-Islam militants were also arrested while a dozen others were injured. Two peace committee members were killed and 22 others injured in a bomb blast in the same area. On April 13, 2013, Pakistan Army's ISPR said that seven militants were killed in the Tirah Valley on April 12. It did not confirm the casualties suffered by the security forces. On April 16, 2013 a member of Zakhakhel peace committee (Tawheedul-ul-Islam) was killed in a bomb blast in Dari area of Tirah Valley. On May 2, 2013 four Taliban-linked insurgents were killed and five others wounded after Pakistani fighter jets targeted TTP hideouts in the Tirah Valley. On May 5, 2013 Pakistan Army's ISPR said that 16 insurgents and two soldiers were killed during heavy clashes in the Tirah Valley. Three soldiers were reported to be wounded. The military also claimed to have captured militant strongholds Kismat Sur and Sanghar & recovered huge cache of arms & ammunition from the militants fleeing from the area. The HDI index of Pakistan, showing the major economic development in the country. Since 2006, major initiatives have been taken out by the government to reconstruct and rehabilitate the war-torn areas of FATA and Khyber Pakhtunkhwa. The military administrator of the National Disaster Management Authority (NDMA), Lieutenant-General Nadeem Ahmad, supervised majority of the socioeconomic development in the areas that were badly effected by the military operations. The government took many initiatives, including promotion the political activities under the Political Parties Act, the construction of the Peshawar-Torkham Road and the establishment of the Investment Bank of FATA, envisioned to bring prosperity and provide employment opportunities. Around ₨ 1 billion were spend for the rehabilitation of the IDPs and ₨ 500 million were immediately transferred into the account of Khyber Pakhtunkhwa government for the economic development in the province. Under the 2006–15 program, a nine-year project, over $2.06 billion would be spend for the economic reconstruction of the FATA region, with the U.S. Government has pledged to provide $750 million over a period of 5 years. Since 2010, the engineering units of army, the Frontier Works Organisation (FWO) and Corps of Engineers and Military Engineering Service, have been active in the area to reconstruct the war-torn areas. Major operations were carried out by the FWO to completed the wide canvas of works, including construction of over 400 km roads, dams, canals and hydroelectric works. The engineering units commenced the work on Gomal Zam Dam in Waziristan with the help of the local tribal people who were employed for this mega project. The Pakistan Army started the political and educational activities after rebuilding the damaged schools and colleges in Waziristan and gaven admissions to as many as young tribal teenagers and young men and women in the army institutions since August 2011. US Defence Secretary Robert Gates laying flowers and straightens out a wreath to commemorate the soldiers and personnel of Pakistan military in 2010. In a debriefing to parliamentarians on 19 October 2011, the ISPR stated that a total of ~3,097 soldiers and personnel were killed and 721 other were permanently disabled in the war on terror. The ISI lost 63 of its personnel owing to targeted assaults on ISI installations. In the same government report, it confirmed that since 2001 a total of ~40,309 Pakistanis, both military and civilian, had lost their lives in the conflict. In addition, the TPP and Central Asian militant groups suffered a staggering number of human casualties, and according to the reports ~20,742 militants had been killed or captured by February 2010. Among these, by November 2007, were 488 foreign fighters killed, 24 others arrested and 324 injured. 220 policemen were killed in fighting in 2007 and 2008. Before all-out fighting broke out in 2003, independent news sources reported only four incidents of deaths of Pakistani forces in 2001 and 2002, in which a total of 20 soldiers and policemen were killed. The independent South Asia Terrorism Portal website has estimated that at least 1,865 soldiers and policemen were killed between 2003 and 2008. The Pak Institute For Peace Studies has estimated that 1,185 soldiers and policemen were killed in 2009. At least, 857 soldiers and policemen were reported captured by the militants in the course of the war, with at least 558 of them being released; others were perished. Naushad Ali Khan of Pakistan Government's Research and Analysis, NWFP Police in his article Suicide and terrorist attacks and police actions in NWFP, Pakistan has provided details of different activities of the terrorists during 2008. Accordingly 483 cases were registered with 533 deaths and 1290 injured. Similarly 29 suicidal attacks were recorded, resulting 247 deaths and 695 injuries. During the same period 83 attempts acts of terrorism were foiled by the NWFP Police. Since the success of unified military operations in 2009-2011, the Waziristan war has been heavily featured in Pakistan media, including in theatre, television, cinema, music, video games and literature. The war also influenced Pakistan's civil society to gather their support for Pakistan Armed Forces through the media miniseries and films that were released throughout the war. Pakistan's rock bands, such as Entity Paradigm, Strings, Call and Mizraab released many patriotic songs to gather support for the Pakistan armed forces to tackle down the insurgency. The country's most notable band, Junoon, released their album, Rock & Roll Jihad and literature Rock & Roll Jihad: A Muslim Rock Star's Revolution in 2010. CNS Adm Noman Bashir shakes hand with General David Petraeus to strengthen the partnership with the United States. The military involvement of the United States in this conflict came at a bad juncture whose image and credibility in the country was already defamed and maligned, due to their constant pressure on Musharraf, to keep the military debriefings of a senior scientist suspected in proliferation matters since 2004. The US Ambassador Cameron Munter found it difficult to counter the Anti-American sentiment in the country, especially after the Raymond Davis incident. The Anti-Americanism sentiment in Pakistan is one of the strongest in the world. The Anti-Americanism has risen as a result of U.S. military drone strikes introduced by President George W. Bush and continued by President Barack Obama as his counter-terrorism policy. In the aftermath of the 2010 Pakistan floods, the Pakistani civil society was further frustrated with the United States for not doing enough not to deal with the humanitarian crisis, noting that the US spends $5 billion every month in the war in Afghanistan. These sentiments were further intensified due to the killing of Osama Bin Laden by American forces. As of present, almost 60%-80% of Pakistanis consider the United States as an enemy combatant state. The Anti-Americanism has been provoked mainly as a reaction from those who are critical of American CIA activities in Pakistan, such as the infamous break-out of the Raymond Allen Davis incident and American intrusions from Afghanistan border such as the 2011 NATO attack in Pakistan. It has often confronted expatriate Americans in Pakistan too. According to a recent reports of Gallup Pakistan, approximately 3 in 4 Pakistanis now consider the United States as an enemy state. The polls show increasing hostility towards the United States and new lows in the already strained relationship between the two countries. The credibility of Obama administration was undermined in the country and, furthermore, approximately 4 in 10 Pakistanis believe that U.S. military and economic aid is having a negative impact on their country; only 1 in 10 believes the impact has been positive. According to the Dawn media report, the Pakistani civil society views India as the "perpetual enemy" and the United States as an "unfaithful ally". Studies and research conducted by Pakistan's leading economists and the financial experts, the war hit Pakistan's national economy "very hard", and the outcomes produced by the war on country's national economy, were surprising and unexpected to Pakistan's military and economic planners. The government economic institutions of Pakistan referred the conflict as "economic terrorism" and according to the one Pakistani economist, the indirect and direct cost of the war was around $2.67 billion in 2001-02, which raised up to $13.6 billion by 2009-10, projected to rise to $17.8 billion in the current financial year (2010–11). The country's national investment-to-GDP ratio has nosedived from 22.5% in 2006-07 which went down to 13.4% in 2010-11 with serious consequences for job Creating ability of the economy. The leading English language newspaper, The Nation gave great criticism to United States, and called U.S. role as "economic terrorism" in South Asia. Economic decay during the time of conflict. Exponentially rising the GDP to 8.96% (2004), it decayed to 1.21% (2008-9). Until July 2009 the conflict, as well as terrorism in Pakistan, had cost Pakistan $35 billion. According to US Congress and the Pakistani media, Pakistan has received about $18 billion from the United States for the logistical support it provided for the counter-terrorism operations from 2001 to 2010, and for its own military operation mainly in Waziristan and other tribal areas along the Durand Line. The Bush administration also offered an additional $3 billion five-year aid package to Pakistan for becoming a frontline ally in its 'War on Terror'. Annual installments of $600 million each split evenly between military and economic aid, began in 2005. 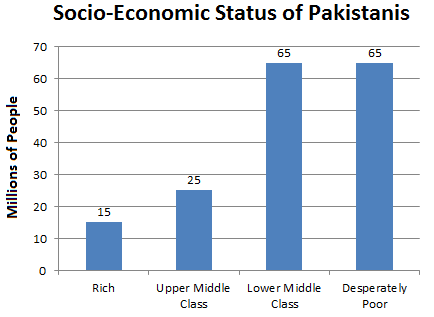 Socioeconomic graph: The war hit Pakistan's national economy very hard, generally effecting 65 million people. In 2009, President Barack Obama pledged to continue supporting Pakistan and has said Pakistan would be provided economic aid of $1.5 billion each year for the next five years. Unfolding a new US strategy to defeat Taliban and Al-Qaeda, Obama said Pakistan must be a 'stronger partner' in destroying Al-Qaeda safe havens. In addition, President Obama has also planned to propose an extra $2.8 billion in aid for the Pakistani military to intensify the US-led 'War on Terror' along the Pakistan-Afghanistan border. The military aid would be in addition to the civilian aid of $1.5 billion a year for the next five years from 2009 onwards. In his autobiography, President Musharraf wrote that the United States had paid millions of dollars to the Pakistan government as bounty money for capturing al-Qaeda operators from tribal areas bordering Afghanistan. About 359 of them were handed over to the US for prosecution. Pakistan has purchased 1,000 laser-guided bomb kits and 18 F-16 fighter jets from USA. Amongst Pakistanis opinion about the role of the US is generally negative. Incidents of terrorism cause rage and anger against the terrorist organizations but they also cause frustration with the United States. According to Pew Global Polls only 17% of Pakistanis have a positive view of the US and only 11% see it as a useful partner in the 'War on Terror'. ↑ 1.0 1.1 ROBERT MACKEY (May 23, 2011). "Before Attack, Pakistan’s Navy Boasted of Role in Fight Against Taliban". http://thelede.blogs.nytimes.com/2011/05/23/before-attack-pakistans-navy-boasted-of-role-in-fight-against-taliban/. Retrieved 13 November 2012. ↑ "Aman Lashkar leader among 4 killed in Peshawar". http://www.geo.tv/GeoDetail.aspx?ID=56201/. Retrieved 2 January 2013. ↑ "Former Pakistani Taliban No 2 arrested in Afghanistan: Reports". http://dawn.com/2013/02/18/former-pakistani-taliban-no-2-arrested-in-afghanistan-reports/. ↑ "Taliban leader killed in firefight with police – The Express Tribune". Tribune.com.pk. August 26, 2010. http://tribune.com.pk/story/43000/taliban-leader-killed-in-firefight-with-police/. Retrieved March 26, 2011. ↑ "US missile strike 'kills al-Qaeda chief' in Pakistan". BBC News. September 28, 2010. http://www.bbc.co.uk/news/world-south-asia-11429016. ↑ Barnes, Julian E. (January 23, 2010). "Pentagon chief defends arms sales to India, Pakistan". Los Angeles Times. http://www.latimes.com/news/nation-and-world/la-fg-gates23-2010jan23,0,6998676.story. Retrieved March 26, 2011. ↑ "Pakistan, Saudi Arabia Cleared for U.S. Arms Buys". Armscontrol.org. September 11, 2001. http://www.armscontrol.org/print/2096. Retrieved December 17, 2011. ↑ "American Dead in Pakistan Bombing Were Special Forces – ABC News". USA: ABC. February 3, 2010. http://abcnews.go.com/International/us-military-die-pakistan-bombing/story?id=9734681. Retrieved March 26, 2011. ↑ 9.0 9.1 Waraich, Omar (June 16, 2009). "Pakistan's Next Fight? Taliban Leader Baitullah Mehsud". TIME. http://www.time.com/time/world/article/0,8599,1904905,00.html. Retrieved March 26, 2011. ↑ "A Profile of Mangal Bagh". TheLongWarJournal. http://www.longwarjournal.org/multimedia/Mangal-Bagh-Profile.pdf. ↑ "Pak Taliban claims to be using Afghan soil". Rediff News. June 26, 2012. http://www.rediff.com/news/report/pak-taliban-claims-to-be-using-afghan-soil/20120626.htm. Retrieved December 24, 2012. ↑ "Terrorist Organization Profile: Islamic Movement of Uzbekistan (IMU)". START. http://www.start.umd.edu/start/data_collections/tops/terrorist_organization_profile.asp?id=4075. Retrieved January 4, 2013. ↑ 13.0 13.1 "‘49,000 Pakistanis have been killed since the war on terror began in 2001’". April 30, 2013. http://tribune.com.pk/story/542287/49000-pakistanis-have-been-killed-since-the-war-on-terror-began-in-2001/. Retrieved April 30, 2013. ↑ "Forgotten victims of Pakistan’s Taliban war". dawn.com. http://www.dawn.com/2011/04/25/forgotten-victims-of-pakistans-taliban-war-3.html. Retrieved May 23, 2011. ↑ "Pakistan Timeline – 2009". SATP. 2009. http://www.satp.org/satporgtp/countries/pakistan/timeline/index.html. Retrieved July 2, 2009. ↑ "Taliban kill, then behead three Pakistan tribesmen". The China Post. Taiwan (ROC). March 14, 2009. http://www.chinapost.com.tw/asia/pakistan/2009/03/14/200108/Taliban-kill.htm. Retrieved March 26, 2011. ↑ RAVI NESSMAN, Associated Press Writer (January 7, 2008). "Tribesmen Killed in Northwest Pakistan". Fox News. http://www.foxnews.com/wires/2008Jan07/0,4670,PakistanMilitants,00.html. Retrieved March 26, 2011. ↑ "Five tribesmen killed in NW Pakistan – People's Daily Online". People's Daily. May 7, 2009. http://english.people.com.cn/90001/90777/90851/6653244.html. Retrieved March 26, 2011. ↑ "Officials say 12 tribesmen, 4 Taliban killed in clashes in restive northwest Pakistan". Blog.taragana.com. July 4, 2009. http://news.gaeatimes.com/officials-say-12-tribesmen-4-taliban-killed-in-clashes-in-restive-northwest-pakistan-99234/. Retrieved March 26, 2011. ↑ DPA (August 12, 2009). "More than 100 killed in Pakistan clashes". Earth Times News - Earthtimes.org. http://www.earthtimes.org/articles/show/281195,more-than-100-killed-in-pakistan-clashes--summary.html. Retrieved March 26, 2011. ↑ "U.S. Fatalities in and around Afghanistan". iCasualties. September 9, 2005. http://icasualties.org/oef/. Retrieved July 4, 2010. ↑ Fatalities in Terrorist Violence in Pakistan 2003-2013. Satp.org (2013-08-18). Retrieved on 2013-08-22. ↑ "Red Cross 'gravely concerned' about conditions in Swat Valley". CNN. May 31, 2009. http://edition.cnn.com/2009/WORLD/asiapcf/05/31/pakistan.red.cross/index.html. Retrieved March 26, 2011. ↑ "DefenseLink News Article: American Diplomat Killed In Pakistan Suicide Attack". Defenselink.mil. http://www.defenselink.mil/news/newsarticle.aspx?id=15292. Retrieved October 19, 2008. ↑ "GMANews.TV – Suicide attacks soar in Pakistan since 2007 – World – Official Website of GMA News and Public Affairs – Latest Philippine News – BETA". Gmanews.tv. http://www.gmanews.tv/story/123833/Suicide-attacks-soar-in-Pakistan-since-2007. Retrieved October 19, 2008. ↑ 30.0 30.1 30.2 Varun Vira and Anthony Cordesman "Pakistan: Violence versus Stability: A Net Assessment." Center for Strategic and International Studies, 25 July 2011. ↑ "The War in Pakistan". The Washington Post. January 25, 2006. http://www.washingtonpost.com/wp-dyn/content/article/2006/01/24/AR2006012401528.html. Retrieved October 19, 2008. ↑ Zaffar Abbas (Last Updated:). "Pakistan's undeclared war". News.bbc.co.uk. http://news.bbc.co.uk/2/hi/south_asia/3645114.stm. Retrieved October 19, 2008. ↑ 33.0 33.1 33.2 "[Pakistan Primer Pt. 1] The Rise of the Pakistani Taliban," Global Bearings, October 27, 2011. ↑ David Montero (June 22, 2006). "Killing scares media away from Waziristan". Christian Science Monitor. http://www.csmonitor.com/2006/0622/p07s02-wosc.html. Retrieved August 25, 2008. ↑ "Pakistan attacks Waziristan compound". Al Jazeera. March 16, 2006. http://english.aljazeera.net/archive/2006/06/2008410114854246429.html. Retrieved August 25, 2008. ↑ 36.0 36.1 U.S. Government. "Central Eurasian and Central Asian Terrorism". United States Government National Center for Counter-terrorism. United States Government National Center for Counter-terrorism. http://www.nctc.gov/site/groups/cent_eurasian.html. Retrieved 2 July 2013. ↑ Thompson, Clifford. "Terrorism from Central Asian Republics". Pakistan Strategic Think Tanks. Pakistan Strategic Think Tanks. http://pakistanthinktank.org/category/indian-terrorism-from-central-asian-republics. Retrieved 2 July 2013. ↑ Shaun Waterman (Wednesday, March 27, 2013). "Heavy price: Pakistan says war on terror has cost nearly 50,000 lives there since 9/11". http://www.washingtontimes.com/news/2013/mar/27/heavy-price-pakistan-says-war-terror-has-cost-near/. Retrieved 16 June 2013. ↑ Wahab, Ali (July 11, 2010). "The real cost of Pakistan’s war on terror". http://tribune.com.pk/story/27191/the-real-cost-of-pakistans-war-on-terror/. Retrieved 16 June 2013. ↑ 40.0 40.1 From the Newspapers (20 June 2011). "War on terror cost Pakistan $67.9 billion". http://dawn.com/2011/06/20/war-on-terror-cost-pakistan-679-billion/. Retrieved 16 June 2013. ↑ Farrukh Salim, PhD (April 29, 2012). "4G War". http://www.thenews.com.pk/Todays-News-9-105618-4G-War. Retrieved 7 June 2013. ↑ 42.0 42.1 Correspondents (6 May 2002). "Govt warned against US operation in Fata". http://archives.dawn.com/2002/05/06/nat1.htm. Retrieved 1 July 2013. ↑ 43.0 43.1 43.2 Our Correspondent (June 6, 2002). "Tribesmen allow army to enter Shawal". http://archives.dawn.com/2002/06/06/nat2.htm. Retrieved 1 July 2013. ↑ Bureau Chief (August 10, 2003). "Occupation of sovereign states by US flayed". http://archives.dawn.com/2003/08/10/nat7.htm. Retrieved 1 July 2013. ↑ By Our Staff Reporter (October 6, 2003). "Wana operation condemned". http://archives.dawn.com/2003/10/06/nat5.htm. Retrieved 1 July 2013. ↑ Our Reporter (August 10, 2003). "Occupation of sovereign states by US flayed". http://archives.dawn.com/2003/08/10/nat7.htm. Retrieved 1 July 2013. ↑ 47.0 47.1 Rohde, David (September 10, 2006). "Al Qaeda Finds Its Center of Gravity". New York Times. http://www.nytimes.com/2006/09/10/weekinreview/10rohde.html. Retrieved September 12, 2006. ↑ 48.0 48.1 Dawn news, area studies, Zulfiqar Ali (16 March 2004). "Musharraf warns against failure of Wana operation". http://archives.dawn.com/2004/03/16/top4.htm. Retrieved 2 July 2013. ↑ Khan, Ismail (March 19, 2004). "Al Zawahiri believed surrounded: Intensity of resistance indicates presence of high-value target, says Musharraf". http://archives.dawn.com/2004/03/19/top2.htm. Retrieved 2 July 2013. ↑ Khan, Ismail (March 26, 2004). "Army winding up operation: Corps Commander". http://archives.dawn.com/2004/03/26/top3.htm. Retrieved 2 July 2013. ↑ Our Reporter (March 28, 2004). "Top Al Qaeda leader hurt, hiding in Wana: ISPR". http://archives.dawn.com/2004/03/28/top3.htm. Retrieved 2 July 2013. ↑ 52.0 52.1 52.2 52.3 Ismail Khan (March 28, 2004). "Militants agree to set free hostages: Uzbek warlord hurt while fleeing". http://archives.dawn.com/2004/03/28/top2.htm. Retrieved 2 July 2013. ↑ Syed Irfan Raza & Dilawar Khan Wazir. "More Troops depolyed". 06 October 2004. Dawn News Archives 2004. http://archives.dawn.com/2004/10/06/top3.htm. Retrieved 7 June 2013. ↑ 54.0 54.1 By Arshad Sharif. "New JCSC chief, VCOAS appointed". 03 October 2004. Dawn, 03 October 2004. http://archives.dawn.com/2004/10/03/top1.htm. Retrieved 7 June 2013. ↑ Staff (April 17, 2007). "Extremism greatest threat: president". http://archives.dawn.com/2007/04/17/top5.htm. Retrieved 8 June 2013. ↑ 56.0 56.1 Our Correspondent (November 3, 2007). "Waziristan truce went wrong: Gen Ehsan". http://archives.dawn.com/2007/11/03/nat2.htm. Retrieved 8 June 2013. ↑ 57.0 57.1 57.2 Raza, Syed Irfan (May 5, 2005). "Al Qaeda’s number three Faraj Al Libbi arrested". http://archives.dawn.com/2005/05/05/top1.htm. Retrieved 2 July 2013. ↑ John Diamond (May 4, 2005). "Pakistan reports arrest of Osama bin Laden's operations chief". USA Today. http://www.usatoday.com/news/world/2005-05-04-pakistan-arrest_x.htm?POE=NEWISVA. ↑ 59.0 59.1 Anwarullah Khan (January 14, 2006). "Attack in Bajaur Agency kills 18: Raid believed to be made by US aircraft". http://archives.dawn.com/2006/01/14/top3.htm. Retrieved 2 July 2013. ↑ "'Policemen killed' in Waziristan". BBC News. June 22, 2006. http://news.bbc.co.uk/2/hi/south_asia/5104784.stm. Retrieved August 7, 2006. ↑ "Forces, militants heading for truce". Dawn. June 22, 2006. http://www.dawn.com/2006/06/23/top2.htm. ↑ Bureau Report (June 22, 2006). "Jirga brokers peace deal between rival tribes". http://archives.dawn.com/2006/06/22/nat7.htm. Retrieved 2 July 2013. ↑ 63.0 63.1 Gul, Pazir (September 6, 2006). "Waziristan accord signed". http://archives.dawn.com/2006/09/06/top2.htm. Retrieved 2 July 2013. ↑ Press, Associated (September 2, 2006). "Pakistan, Taliban militants sign peace agreement". Fr.jpost.com. http://fr.jpost.com/servlet/Satellite?cid=1154525988190&pagename=JPost/JPArticle/ShowFull. Retrieved March 26, 2011. ↑ "Waziristan accord signed". Dawn.com. http://www.dawn.com/2006/09/06/top2.htm. Retrieved March 26, 2011. ↑ 68.0 68.1 68.2 68.3 Anwarullah Khan (October 31, 2006). "82 die as missiles rain on Bajaur: Pakistan owns up to strike; locals blame US drones". http://archives.dawn.com/2006/10/31/top1.htm. Retrieved 2 July 2013. ↑ Dlavar Khan Wazir (8 November 2006). "Rockets rain on Wana during governor’s visit: Aurakzai not targeted: spokesman". http://archives.dawn.com/2006/11/08/top1.htm. Retrieved 2 July 2013. ↑ 70.0 70.1 70.2 Khan, Ismail (8 November 2006). "uicide attack on army base: 40 troops dead; search on for bomber’s aide". http://archives.dawn.com/2006/11/09/top1.htm. Retrieved 2 July 2013. ↑ Roggio B (March 17, 2007). "Pakistan signs the Bajaur Accord". The Long War Journal. http://www.longwarjournal.org/archives/2007/03/pakistan_signs_the_b.php. Retrieved on January 14, 2008. ↑ Stakelbeck E (April 3, 2007). "Bajaur: When 'Peace' Yields War". CBN News. http://www.cbn.com/CBNnews/130966.aspx. [dead link] Retrieved on January 14, 2008. ↑ Roggio B. "The fall of northwestern Pakistan: An online history". The Long War Journal. http://www.longwarjournal.org/archives/2006/09/the_fall_of_wazirist.php. Retrieved on January 13, 2008. ↑ 74.00 74.01 74.02 74.03 74.04 74.05 74.06 74.07 74.08 74.09 74.10 74.11 74.12 74.13 Zaidi, Dr. Syed Manzar Abbas (4 February 2013). "Uzbek Militancy in Pakistan" (Microsoft Word). SISA Report No. 1 2013. Centre for International and Strategic Analysis. http://strategiskanalyse.no/publikasjoner%202013/2013-02-04_SISA1_Uzbek_Militancy_in_Pakistan_-_Syed_Manzar_Abbas_Zaidi.pdf. Retrieved 1 July 2013. ↑ Plett B (April 12, 2007). "Tribesmen 'oust' foreign fighters". BBC. http://news.bbc.co.uk/2/hi/south_asia/6547783.stm. Retrieved on January 16, 2008. ↑ "Tribe in Pakistan security plea". BBC. April 16, 2007. http://news.bbc.co.uk/2/hi/south_asia/6559365.stm. Retrieved on January 16, 2008. ↑ "FOXNews.com – Two Days of Homicide Attacks Kill 70 in Pakistan". Fox News. July 15, 2007. http://www.foxnews.com/story/0,2933,289340,00.html. Retrieved October 19, 2008. ↑ Ismail Khan. "Suicide Bombers Kill 49 in Pakistan". Fairuse.100webcustomers.com. Archived from the original on March 11, 2008. http://web.archive.org/web/20080311092541/http://fairuse.100webcustomers.com/fairenough/nytA31.html. Retrieved October 19, 2008. ↑ "Scores killed in Pakistan attacks". News.bbc.co.uk. Last Updated:. http://news.bbc.co.uk/2/hi/south_asia/6905808.stm. Retrieved October 19, 2008. ↑ "12-hour curfew clamped on Swat -DAWN – Top Stories; November 17, 2007". Dawn.com. http://www.dawn.com/2007/11/17/top7.htm. Retrieved October 19, 2008. ↑ "Musharraf imposes emergency rule". Dawn. November 3, 2007. http://www.dawn.com/2007/11/04/top1.htm. Retrieved November 3, 2007. ↑ "Martial law declared in Pakistan". CNN. November 3, 2007. Archived from the original on November 4, 2007. http://web.archive.org/web/20071104002516/http://www.cnn.com/2007/WORLD/asiapcf/11/03/pakistan.emergency/index.html. Retrieved November 3, 2007. ↑ Nelson, Dean (November 4, 2007). "Pervez Musharraf spoils for a fight as he declares emergency rule". The Times. London. http://www.timesonline.co.uk/tol/news/world/asia/article2800993.ece. Retrieved November 4, 2007. ↑ Gall, Carlotta; Masood, Salman (October 19, 2007). "Bomb Attack Kills Scores in Pakistan as Bhutto Returns". The New York Times. http://www.nytimes.com/2007/10/19/world/asia/19pakistan.html. Retrieved December 27, 2007. ↑ "Pakistani troops 'flee border post'". Al Jazeera. January 17, 2008. http://english.aljazeera.net/NR/exeres/EA53A69D-1973-4C86-8064-D4FCB4C40FB1.htm. Retrieved on January 18, 2008. ↑ "Pakistan attacks hit aid group, military HQ". CNN. February 25, 2008. http://edition.cnn.com/2008/WORLD/asiapcf/02/25/pakistan.blast/index.html. Retrieved October 19, 2008. ↑ 97.0 97.1 97.2 AAJ News (13 December 2007). "Armed Forces guardian of national integrity: General Tariq Majid". http://www.aaj.tv/2007/12/armed-forces-guardian-of-national-integrity-general-tariq-majid/. Retrieved 9 March 2013. ↑ "BBC NEWS | South Asia | Pakistani militants 'call truce'". News.bbc.co.uk. Last Updated:. http://news.bbc.co.uk/2/hi/south_asia/7232203.stm. Retrieved October 19, 2008. ↑ "Al Jazeera English – News – Pakistan Troops To Vacate Swat". English.aljazeera.net. http://english.aljazeera.net/NR/exeres/D1AC8679-0D78-4829-952A-004CCA5DA283.htm. Retrieved October 19, 2008. ↑ "Baitullah men storm Jandola -DAWN – Top Stories; June 24, 2008". Dawn.com. http://www.dawn.com/2008/06/24/top8.htm. Retrieved October 19, 2008. ↑ Laura King and Zulfiqar Ali (August 10, 2008). "Pakistan fighting ends as troops withdraw – Los Angeles Times". Los Angeles Times. http://www.latimes.com/news/nationworld/world/la-fg-pakistan10-2008aug10,0,6869936.story. Retrieved October 19, 2008. ↑ "BBC NEWS | South Asia | 'Dozens die' in Pakistan clashes". News.bbc.co.uk. August 10, 2008<!- – 12:44 UK -->. http://news.bbc.co.uk/2/hi/south_asia/7552425.stm. Retrieved October 19, 2008. ↑ "Twin suicide bombers hit factory in Pakistan". Archived from the original on June 1, 2009. http://www.webcitation.org/5hDa0L4PI. Retrieved March 24, 2009. ↑ David Montero. "Pakistani tribesmen organize private armies to fight Taliban". Csmonitor.com. http://www.csmonitor.com/World/terrorism-security/2008/0901/p99s01-duts.html. Retrieved October 19, 2008. ↑ 112.0 112.1 Saeed Shah (September 26, 2008). "Pakistani tribesmen organize to fight Taliban insurgents". McClatchy Washington Bureau. http://www.mcclatchydc.com/226/story/53151.html. Retrieved October 19, 2008. ↑ "U.S. hopes to arm Pakistani tribes against Al Qaeda – International Herald Tribune". International Herald Tribune. Archived from the original on November 19, 2007. http://web.archive.org/web/20071119152243/http://www.iht.com/articles/2007/11/19/america/19policy.php. Retrieved October 19, 2008. ↑ Eric Schmitt, Mark Mazzetti And Carlotta Gall (Published: November 19, 2007). "U.S. Hopes to Use Pakistani Tribes Against Al Qaeda". New York Times. http://www.nytimes.com/2007/11/19/washington/19policy.html?_r=1&adxnnl=1&ref=world&adxnnlx=1222717017-fvB/geZ6uJD4OkQF6LCPSg&oref=slogin. Retrieved October 19, 2008. ↑ "Pakistani Army Says 60 Suspected Militants Killed". Fox News. September 23, 2008. http://www.foxnews.com/story/0,2933,426207,00.html. Retrieved October 19, 2008. ↑ Our Staff Reporter 0 (August 11, 2009). "PAF capable of mid-air refuelling". http://www.nation.com.pk/pakistan-news-newspaper-daily-english-online/politics/11-Aug-2009/PAF-capable-of-midair-refuelling. Retrieved 15 June 2013. ↑ "The Standard – Hong Kong's First Free English Newspaper". Thestandard.com.hk. http://www.thestandard.com.hk/breaking_news_detail.asp?id=6788&icid=4&d_str=20080926. Retrieved October 19, 2008. ↑ 121.0 121.1 "AFP: Pakistan says 1,000 militants killed near Afghan border". Google. September 26, 2008. Archived from the original on September 29, 2008. http://web.archive.org/web/20080929110515/http://afp.google.com/article/ALeqM5iGTgxqoTldD4lBtlbyfU5MSNowjg. Retrieved October 19, 2008. ↑ "Pakistan says 1,000 militants killed in Bajaur campaign | Reuters". In.reuters.com. September 26, 2008. http://in.reuters.com/article/southAsiaNews/idINIndia-35671020080926. Retrieved October 19, 2008. ↑ "Pak security forces kill 16 militants". Outlookindia.com. October 23, 2008. http://www.outlookindia.com/pti_news.asp?id=623925. Retrieved March 26, 2011. ↑ "Archive | Your Source of News on the World Wide Web". Dawn.Com. http://dawn.com/2008/10/24/welcome.htm. Retrieved March 26, 2011. ↑ Perlez, J. & Shah, P.Z. 2008, 'US attack on Taliban kills 23 in Pakistan' most of the people killed in these attacks are civilians., International Herald Tribune, September 9. Retrieved on September 10, 2008. ↑ "AFP: Taliban militants behead four in Pakistan: officials". Google. October 11, 2008. Archived from the original on July 8, 2009. http://web.archive.org/web/20090708135114/http://afp.google.com/article/ALeqM5gPevBKLIKB_Sph1HS5oMlCCzlAbA. Retrieved October 19, 2008. ↑ "Four pro-govt tribal elders beheaded -DAWN – Top Stories; October 11, 2008". Dawn.com. http://www.dawn.com/2008/10/11/top16.htm. Retrieved October 19, 2008. ↑ "Dozens killed in Pakistan bombing". BBC. October 10, 2008. http://news.bbc.co.uk/1/hi/world/south_asia/7663574.stm. Retrieved October 19, 2008. ↑ "Militants grab U.S. military Humvees in ambush". CNN. November 11, 2008. http://www.cnn.com/2008/WORLD/asiapcf/11/11/pakistan.convoy.attack/index.html. Retrieved March 26, 2011. ↑ "Troops defeat Taliban in Pakistan’s Bajaur region". The Indian Express. March 1, 2009. http://www.indianexpress.com/news/troops-defeat-taliban-in-pakistans-bajaur-region/429310. Retrieved March 26, 2011. ↑ "Taliban Invasion Is About Power, Not Islam In Pakistan". Help The Middle Class. May 10, 2009. http://helpthemiddleclass.com/2009/05/10/taliban-invasion-is-about-power-not-islam-in-pakistan/. Retrieved March 26, 2011. ↑ "Swat girl flogging video 'fake': Pak probe team". The Indian Express. April 19, 2009. http://www.indianexpress.com/news/swat-girl-flogging-video-fake-pak-probe-t/448781/. Retrieved March 26, 2011. ↑ "Football Bomb Kills 12 Children In Northern Pakistan While Another Four Die As Grenade Explodes". News.sky.com. http://news.sky.com/skynews/Home/World-News/Football-Bomb-Kills-12-Children-In-Northern-Pakistan-While-Another-Four-Die-As-Grenade-Explodes/Article/200904415269416?lpos=World_News_Article_Related_Content_Region_10&lid=ARTICLE_15269416_Football_Bomb_Kills_12_Children_In_Northern_Pakistan_While_Another_Four_Die_As_Grenade_Explodes. Retrieved March 27, 2011. ↑ From Reza Sayah CNN (May 30, 2009). "Pakistan secures key Swat Valley city". CNN. http://edition.cnn.com/2009/WORLD/asiapcf/05/30/pakistan.mingora/index.html. Retrieved March 26, 2011. ↑ "South Asia | Pakistan army 'regains' Swat city". BBC News. May 30, 2009. http://news.bbc.co.uk/1/hi/world/south_asia/8075136.stm. Retrieved March 26, 2011. ↑ "1.6 million Pakistani refugees return home: UN – Times Of India". The Times of India. August 22, 2009. http://articles.timesofindia.indiatimes.com/2009-08-22/pakistan/28191405_1_refugees-return-home. Retrieved March 26, 2011. ↑ "1.3 million displaced Pakistanis return home: UN". Sify.com. August 19, 2009. http://sify.com/news/fullstory.php?a=jitoubcchjh&title=1.3_million_displaced_Pakistanis_return_home:_UN. Retrieved December 17, 2011. ↑ "Pakistan forces move on Taliban". October 17, 2009. http://news.bbc.co.uk/1/hi/world/south_asia/8311927.stm. ↑ "Taliban retake town as Pakistan offensive runs into trouble | McClatchy". Mcclatchydc.com. http://www.mcclatchydc.com/world/story/77472.html#. Retrieved March 27, 2011. ↑ "South Asia | Pakistan 'takes key Taliban town'". BBC News. October 24, 2009. http://news.bbc.co.uk/2/hi/south_asia/8323660.stm. Retrieved March 27, 2011. ↑ "Pakistan takes Taliban stronghold". BBC News. November 2, 2009. http://news.bbc.co.uk/2/hi/south_asia/8337211.stm. ↑ Bill Roggio (November 1, 2009). "Pakistani Army surrounds major Taliban strongholds in South Waziristan". The Long War Journal. http://www.longwarjournal.org/archives/2009/11/pakistani_army_surro.php. Retrieved March 27, 2011. ↑ Bill Roggio (November 3, 2009). "Pakistan captures two Taliban strongholds in South Waziristan". The Long War Journal. http://www.longwarjournal.org/archives/2009/11/pakistan_captures_tw.php. Retrieved March 27, 2011. ↑ Earth Times Staff (November 21, 2009). "Six Pakistani troops, 14 Taliban killed in clashes – Summary". Earth Times News - Earthtimes.org. http://www.earthtimes.org/articles/show/295667,six-pakistani-troops-14-taliban-killed-in-clashes--summary.html. Retrieved March 27, 2011. ↑ "AFP: Taliban driven out of key battleground: Pakistan PM". Google. December 12, 2009. Archived from the original on December 18, 2009. http://web.archive.org/web/20091218073614/http://www.google.com/hostednews/afp/article/ALeqM5j2KgppauHgJBn0BmkO-eTN3sazoA. Retrieved March 27, 2011. ↑ "Washington TV". Televisionwashington.com. http://www.televisionwashington.com/floater_article1.aspx?lang=en&t=2&id=14573. Retrieved March 27, 2011. ↑ "Pakistan blast toll reaches 45". Malaysia News.Net. October 13, 2009. http://www.malaysianews.net/story/553630. Retrieved March 27, 2011. ↑ "41 killed in terror strikes targeting security forces in Pakistan – Economic Times". Economictimes.indiatimes.com. October 15, 2009. http://economictimes.indiatimes.com/41-killed-in-terror-strikes-targeting-security-forces-in-Pakistan/articleshow/5127531.cms. Retrieved March 27, 2011. ↑ "One killed, nine injured in Peshawar car bomb attack". Malaysia News.Net. October 15, 2009. http://www.malaysianews.net/story/554727. Retrieved March 27, 2011. ↑ "Schools across Pakistan close after deadly suicide blasts". CNN. October 21, 2009. http://www.cnn.com/2009/WORLD/asiapcf/10/21/pakistan.university.explosion/index.html. Retrieved March 27, 2011. ↑ Hussain, Shaiq (November 2, 2009). "Suicide bombing kills 35, injures dozens in Pakistan". The Washington Post. http://www.washingtonpost.com/wp-dyn/content/article/2009/11/02/AR2009110200338.html. Retrieved March 27, 2011. ↑ "Pakistan bombings kill 18 as spy agency hit". Sify.com. November 13, 2009. http://sify.com/news/pakistan-bombings-kill-18-as-spy-agency-hit-news-international-jlnrzcaaeia.html. Retrieved March 27, 2011. ↑ "15 Pakistanis Killed in Peshawar Suicide Bombing, November 14, 2009". United Nations. November 14, 2009. http://www.ccun.org/News/2009/November/15%20n/15%20Pakistanis%20Killed%20in%20Peshawar%20Suicide%20Bombing,%20November%2014,%202009.htm. Retrieved March 27, 2011. ↑ 167.0 167.1 Amir Mir (Monday, June 17, 2013). "Why did a soldier’s son join the Taliban?". http://www.thenews.com.pk/Todays-News-2-184231-Why-did-a-soldiers-son-join-the-Taliban. Retrieved 19 July 2013. ↑ "Security forces seize control of damadola ss". Dawn.com. http://www.dawn.com/wps/wcm/connect/dawn-content-library/dawn/news/pakistan/03-security-forces-seize-control-of-damadola-ss-10. Retrieved March 27, 2011. ↑ "Bajaur declared conflict free zone". Dawn.com. http://www.dawn.com/wps/wcm/connect/dawn-content-library/dawn/the-newspaper/national/bajaur-declared-conflictfree-zone-040. Retrieved March 27, 2011. ↑ "Pakistan’s Orakzai offensive". Gcreport.com. March 29, 2010. http://gcreport.com/index.php/analysis/164-pakistans-orakzai-offensive. Retrieved March 27, 2011. ↑ "Accord for operation in North Waziristan". Dawn.com. http://www.dawn.com/wps/wcm/connect/dawn-content-library/dawn/the-newspaper/front-page/timing-to-be-decided-by-pakistan-accord-for-operation-in-north-waziristan-050. Retrieved March 27, 2011. ↑ "31 militants killed in Pakistan's Orakzai tribal area – People's Daily Online". People's Daily. March 30, 2010. http://english.peopledaily.com.cn/90001/90777/90851/6935244.html. Retrieved March 27, 2011. ↑ "Anti-Taliban operations successful: Pakistan". The Hindu. Chennai, India. June 3, 2010. http://www.hindu.com/2010/06/03/stories/2010060364871700.htm. ↑ GEO Pakistan (2112 PST, Tuesday, May 24, 2011). "War on terror will continue: PM". http://www.geo.tv/5-24-2011/81735.htm. Retrieved 9 March 2013. ↑ Garamone, Jim. "Fight Against Extremists Stretches Pakistan’s Military." American Forces Press Service, April 20, 2011. ↑ "Nation mourns Bashir Ahmed Bilour". 23 December 2012. http://www.thenews.com.pk/article-80817-Nation-mourns-Bashir-Ahmed-Bilour. Retrieved 23 December 2012. ↑ 178.0 178.1 "Pakistani Taliban overrun rival faction's headquarters, dozens killed". March 20, 2013. http://www.longwarjournal.org/archives/2013/03/pakistani_taliban_ov.php. Retrieved April 8, 2013. ↑ "80 killed in clashes between rival militant groups in Pak". Jan 28, 2013. http://www.lensonnews.com/lensonnews/1/51/34339/1/80-killed-in-clashes-between-rival-militant-groups-in-pak.html. Retrieved April 8, 2013. ↑ 180.0 180.1 180.2 "Militant infighting compels thousands to flee Tirah Valley". 2013-03-26. http://centralasiaonline.com/en_GB/articles/caii/features/pakistan/main/2013/03/26/feature-01. Retrieved 8 April 2013. ↑ "Fall of Tirah Valley". March 27, 2013. http://tribune.com.pk/story/527310/fall-of-tirah-valley/. Retrieved 9 April 2013. ↑ APP (June 21, 2013). "Tirah Valley: Security forces clear out militants from Maidan". http://tribune.com.pk/story/566245/tirah-valley-security-forces-clear-out-militants-from-maidan/. Retrieved 2 July 2013. ↑ "Pakistan army starts offensive in NW; 4 troops die". U.S. News & World Report. 5 April 2013. http://www.usnews.com/news/world/articles/2013/04/05/pakistan-army-starts-offensive-in-nw-4-troops-die. Retrieved 8 April 2013. ↑ "Tirah Valley clash leaves 14 militants, 4 security officials dead". The Express Tribune. April 5, 2013. http://tribune.com.pk/story/531500/tirah-valley-clash-leaves-14-militants-4-security-officials-dead/. Retrieved April 8, 2013. ↑ "Warplanes pound militant hideouts in FATA, 8 killed". http://www.geo.tv/article-87422-Warplanes-pound-militant-hideouts-in-FATA-8-killed. Retrieved 16 July 2013. ↑ "Tirah valley operation intensifies, 23 soldiers killed". 07-04-2013. http://dawn.com/2013/04/07/tirah-valley-operation-intensifies-23-soldiers-killed/. Retrieved 09-04-2013. ↑ "30 militants, 23 soldiers killed in Pak clashes". 8 April 2013. http://www.thestatesman.net/index.php?option=com_content&view=article&id=451068&catid=37. Retrieved 9 April 2013. ↑ "30 Pakistan soldiers killed in northwest valley". 8 April 2013. http://www.khaleejtimes.com/kt-article-display-1.asp?xfile=data/international/2013/April/international_April314.xml&section=international. Retrieved 11 April 2013. ↑ "30 Pakistani soldiers killed in northwest valley". April 8, 2013. http://news.yahoo.com/30-pakistani-soldiers-killed-northwest-valley-164518571.html. Retrieved April 11, 2013. ↑ "ISPR confirms deaths of 23 soldiers in Tirah Valley offensive". April 9, 2013. http://dawn.com/2013/04/09/ispr-confirms-deaths-of-23-soldiers-in-tirah-valley-offensive/. Retrieved April 12, 2013. ↑ "110 militants, 23 soldiers killed in Tirah fighting: officials". April 10, 2013. http://www.thenews.com.pk/Todays-News-13-22181-110-militants-23-soldiers-killed-in-Tirah-fighting-officials. Retrieved April 12, 2013. ↑ "At least 15 militants killed in Khyber’s Tirah valley, one soldier killed". 2013-04-11. http://dawn.com/2013/04/11/at-least-15-militants-killed-in-khybers-tirah-valley/. Retrieved 2013-04-13. ↑ "Fighting rages in NW Pakistan, 15 militants, one soldier killed - army". April 11, 2013. http://in.reuters.com/article/2013/04/11/pakistan-military-taliban-idINDEE93A03T20130411. Retrieved April 13, 2013. ↑ "Report: Tirah Operation- Day 6". April 12, 2013. http://www.pakistankakhudahafiz.com/2013/04/12/report-tirah-operation-day-6-talha-ibraheem/. Retrieved April 13, 2013. ↑ "Nine soldiers, 7 militants killed in Tirah". 12 April 2013. http://dawn.com/2013/04/12/nine-soldiers-7-militants-killed-in-tirah/. Retrieved 19 April 2013. ↑ "TTP denies Mangal Bagh appointed Khyber militant chief". 11 April 2013. http://dawn.com/2013/04/11/ttp-denies-mangal-bagh-appointed-khyber-militant-chief/. Retrieved 19 April 2013. ↑ "Seven militants killed in Tirah, Khyber Agency during last 24 hours". April 14, 2013. Archived from the original on June 15, 2013. https://archive.is/CaqVU. Retrieved April 19, 2013. ↑ "Member of lashkar killed in Tirah blast". The News International. April 16, 2013. http://www.thenews.com.pk/Todays-News-7-171746-Member-of-lashkar-killed-in-Tirah-blast. Retrieved April 19, 2013. ↑ "Four militants killed, five injured in Tirah strikes". 1 May 2013. http://dawn.com/2013/05/01/four-militants-killed-five-injured-in-tirah-strikes/. Retrieved 2 May 2013. ↑ "Troops kill 16 militants in Tirah valley: Military". May 5, 2013. http://tribune.com.pk/story/544744/troops-kill-16-militants-in-tirah-valley-military/. Retrieved May 5, 2013. ↑ Riggio, Bill (July 12, 2013). "Pakistani Taliban establish 'base' inside Syria". http://www.longwarjournal.org/archives/2013/07/pakistani_taliban_es.php. Retrieved 16 July 2013. ↑ 202.0 202.1 Pakistan Taliban set up camps in Syria, join anti-Assad war. Reuters. Retrieved on 2013-08-22. ↑ 203.0 203.1 Wali, Ahmed. (2013-07-12) BBC News - Pakistan Taliban 'sets up a base in Syria'. Bbc.co.uk. Retrieved on 2013-08-22. ↑ 204.0 204.1 Staff (May 11, 2009). "Int’l Donors conference to be called for IDPs: Gilani". http://www.app.com.pk/en_/index.php?option=com_content&task=view&id=75786&Itemid=2. Retrieved 9 December 2012. ↑ Staff report (November 25, 2012). "Development projects: FATA ACS highlights initiative". http://tribune.com.pk/story/470914/development-projects-fata-acs-highlights-initiative/. Retrieved 9 December 2012. ↑ 206.0 206.1 206.2 Govt. Pakistan. "FATA Development (2000-2015)". Ministry of Finance. Government of Pakistan (Public Domain). https://docs.google.com/viewer?a=v&q=cache:fIPH-RQCsycJ:www.embassyofpakistanusa.org/forms/FATA%2520Development%2520Program%25202008.pdf+economic+development+in+FATA&hl=en&gl=us&pid=bl&srcid=ADGEESgfEXQ7LQ3hVtlR6zwXY4tKr745j_a5YtNl4nmbnV8Orj7D1hO40gLzYtUcy1b_iKPkpFXVEv0bQz9g4RQkZaqtv-j0ZJwFg_JqKqZxeS_hjKLZD3iJAhzO9nsu6fjTKG5zLTfJ&sig=AHIEtbQWnEsCN4pgoz8Nfy51F0xJKgAVjA. Retrieved 9 December 2012. ↑ PA. "Federally Administered Tribal Areas (FATA) Development Works". FWO. http://www.fwo.com.pk/index.php?option=com_k2&view=item&id=49:federally-administered-tribal-areas-fata-development-works&Itemid=130. Retrieved 9 December 2012. ↑ Staff (Friday, July 02, 2010). "South Waziristan free of terrorists: Army". Archived from the original on 16 April 2013. https://archive.is/aGKbl. Retrieved 9 December 2012. ↑ Muhammad Faisal Ali (1 April 2012). "S. Waziristan marching on road to progress: army". http://dawn.com/2012/04/01/s-waziristan-marching-on-road-to-progress-army/. Retrieved 9 December 2012. ↑ "‘Global war on terror claims 30,000 Pakistani casualties'". ummid.com. http://www.ummid.com/news/2010/February/18.02.2010/cost_of_war_aganist_terror.htm. Retrieved March 26, 2011. ↑ "600 Pakistan security men killed in 28 suicide attacks after Lal Masjid operation". Topnews. http://www.topnews.in/600-pakistan-security-men-killed-28-suicide-attacks-after-lal-masjid-operation-26116. Retrieved October 19, 2008. ↑ Rondeaux, Candace (February 4, 2009). "Taliban Destroys a Key Bridge in Pakistan" (in WP-2009-02-04). The Washington Post. http://www.washingtonpost.com/wp-dyn/content/article/2009/02/03/AR2009020300120.html. Retrieved July 2, 2009. ↑ "Ten Pakistani Soldiers, Two Suspected Al Qaeda Fighters Killed in Gunbattle". Fox News. June 26, 2002. http://www.foxnews.com/story/0,2933,56243,00.html. Retrieved March 27, 2011. ↑ "The Tribune, Chandigarh, India – Main News". The Tribune. India. October 29, 2001. http://www.tribuneindia.com/2001/20011029/main1.htm. Retrieved March 27, 2011. ↑ "7 Killed in Shootout Between Pakistani Forces and Suspected al-Qaida | News | English". Voanews.com. July 3, 2002. Archived from the original on June 18, 2009. http://web.archive.org/web/20090618145411/http://www.voanews.com/english/archive/2002-07/a-2002-07-03-5-7.cfm. Retrieved March 27, 2011. ↑ "Pakistan Assessment 2009". unknown. http://satp.org/satporgtp/countries/pakistan/index.htm. Retrieved July 2, 2009. ↑ "Pak Institute for Peace Studies (PIPS), Independent Think Tank in Pakistan". San-pips.com. http://san-pips.com/index.php?action=reports&id=psr_1. Retrieved March 27, 2011. ↑ "Action Update: March 15–28, 2004". Center for Defense Information. March 31, 2004. Archived from the original on December 28, 2012. https://archive.is/wDJN. Retrieved July 3, 2009. ↑ "More police kidnapped in Pakistan". Al Jazeera. May 21, 2007. http://english.aljazeera.net/news/asia/2007/05/2008525121952942698.html. Retrieved July 3, 2009. ↑ "Tribesmen kill four militants to save army officer". Rantburg. July 7, 2007. http://www.rantburg.com/poparticle.php?ID=192752&D=2007-07-07&SO=&HC=1. Retrieved July 3, 2009. ↑ "Another Pakistani Defeat as More Soldiers Feared Kidnapped". ABC News. October 1, 2007. http://blogs.abcnews.com/theblotter/2007/10/another-pakista.html. Retrieved July 3, 2009. ↑ "Militants seize 120 police, soldiers in Pakistan". September 3, 2007. Archived from the original on June 9, 2007. http://web.archive.org/web/20070609092458/http://afp.google.com/article/ALeqM5igDUu3QEalGnNov6MSBXB2C5UIMQ. Retrieved July 3, 2009. ↑ "10 policemen reported kidnapped". Dawn. December 26, 2007. http://www.dawn.com/2007/12/27/top6.htm. Retrieved July 3, 2009. ↑ "Archive | Your Source of News on the World Wide Web". Dawn.Com. http://www.dawn.com/2008/01/01/welcome.htm. Retrieved March 27, 2011. ↑ "Another Waziristan fort falls to militants". Dawn. January 17, 2008. http://www.dawn.com/2008/01/18/top2.htm. Retrieved July 3, 2009. ↑ "17 Pakistani policemen kidnapped". PressTV.IR. June 23, 2008. http://www.presstv.ir/detail.aspx?id=61138&sectionid=351020403. Retrieved July 3, 2009. ↑ "Taliban abducts 140 soldiers (Pakistan)". Islamoscope. July 3, 2008. http://islamoscope.wordpress.com/2008/07/03/taliban-abducts-140-soldiers-pakistan/. Retrieved July 3, 2009. ↑ "Two policemen kidnapped". Dawn. July 15, 2008. http://www.dawn.com/2008/07/16/top16.htm. Retrieved July 3, 2009. ↑ "Militants Kidnap 25 Police and Paramilitary Troops in Pakistan". ABC News. July 29, 2008. http://abcnews.go.com/Blotter/story?id=5473812&page=1. Retrieved July 3, 2009. ↑ "Ghalanai: ‘Spy’ killed, official freed in Mohmand". Dawn. August 20, 2008. http://www.dawn.com/2008/08/21/local28.htm. Retrieved July 3, 2009. ↑ "Pakistani Policemen Kidnapped; 36 Militants Killed". Javno. September 4, 2008. http://www.javno.com/en-world/pakistani-policemen-kidnapped-36-militants-killed_178863. Retrieved July 3, 2009. ↑ "Suspected militants kidnap 9 policemen in Pakistan". KUNA Kwait News Agency. October 25, 2008. http://www.kuna.net.kw/NewsAgenciesPublicSite/ArticleDetails.aspx?id=1947320&Language=en. Retrieved July 3, 2009. ↑ "30 security men freed after ‘promising to quit force’". Dawn. February 4, 2009. http://www.dawn.com/2009/02/05/top3.htm. Retrieved July 3, 2009. ↑ "Militants kidnap 11 policemen in Pakistan’s Khyber area". Taragana. March 29, 2009. http://news.gaeatimes.com/militants-kidnap-11-policemen-in-pakistans-khyber-area-23285/. Retrieved July 3, 2009. ↑ "4 soldiers kidnapped in Pakistan's Swat". People's Daily. April 21, 2009. http://english.people.com.cn/90001/90777/90851/6641026.html. Retrieved July 3, 2009. ↑ "Taliban kidnap dozens of Pakistani security forces". April 29, 2009. http://wire.antiwar.com/2009/04/29/taliban-kidnap-dozens-of-pakistani-security-forces/. Retrieved July 3, 2009. ↑ "Taleban kidnap 10 paramilitaries in NW Pakistan". Khaleej Times. May 1, 2009. http://www.khaleejtimes.com/DisplayArticle.asp?xfile=data/international/2009/May/international_May35.xml&section=international&col=. Retrieved July 3, 2009. ↑ "Civilians told to flee ahead of Pakistan offensive against Taliban". CNN Asia. May 5, 2009. http://www.cnn.com/2009/WORLD/asiapcf/05/05/pakistan.taliban/index.html?section=cnn_latest. Retrieved July 3, 2009. ↑ "Troops killed in Pakistan clashes". BBC News. May 7, 2009. http://news.bbc.co.uk/2/hi/south_asia/8037281.stm. Retrieved July 3, 2009. ↑ "Computerization of Police Stations in District Swat". NWFP.gov.PK. Archived from the original on May 24, 2008. http://web.archive.org/web/20080524074215/http://www.nwfp.gov.pk/ST_IT/Projects/ComputerizationofPoliceStations.php. Retrieved July 3, 2009. ↑ Tara McKelvey. "A Former Ambassador to Pakistan Speaks Out". Daily Beast. http://www.thedailybeast.com/articles/2012/11/20/a-former-ambassador-to-pakistan-speaks-out.html. Retrieved 23 November 2012. ↑ "Strongest anti-American sentiment in Serbia, Pakistan". B92. 7 July 2009. http://www.b92.net/eng/news/politics-article.php?yyyy=2009&mm=07&dd=07&nav_id=60329. Retrieved August 2010. ↑ GHUND, YUKKA (22 January 2006). "Pakistan seeks to quell anti-American sentiments". USA Today/The Associated Press. http://www.usatoday.com/news/world/2006-01-22-pakistan-aziz_x.htm. Retrieved 21 August 2010. ↑ Stack, Liam (8 July 2009). "Fresh drone attacks in Pakistan reignite debate". The Christian Science Monitor. http://www.csmonitor.com/World/terrorism-security/2009/0708/p99s01-duts.html. Retrieved 21 August 2010. ↑ McGivering, Jill (21 August 2010). "Pakistani flood victims' anger at US". BBC News. Archived from the original on 22 August 2010. http://web.archive.org/web/20100822091039/http://www.bbc.co.uk/news/world-south-asia-11040904. Retrieved 21 August 2010. ↑ Bin Laden anniversary delicate moment for Obama, Romney - Chicago Tribune. Articles.chicagotribune.com (2012-04-25). Retrieved on 2013-08-22. ↑ "Pakistan's flood victims give USAID chief an earful". CNN. 25 August 2010. Archived from the original on 29 August 2010. http://web.archive.org/web/20100829080411/http://edition.cnn.com/2010/WORLD/asiapcf/08/25/pakistan.camps/?. Retrieved 25 August 2010. ↑ 257.0 257.1 257.2 "3 in 4 Pakistanis now consider US an enemy as resentment grows". June 27, 2012. http://rt.com/news/pakistan-consider-us-enemy-940/. Retrieved 5 December 2012. ↑ Malik Siraj Akbar (9 September 2011). "Pakistan views India as the perpetual enemy and the US as an unfaithful ally". http://dawn.com/2011/09/09/pakistan-views-india-as-the-perpetual-enemy-and-the-us-as-an-unfaithful-ally/. Retrieved 5 December 2012. ↑ Sohail Ahmed. "Pakistan’s economy hit hard by war on terro". Central Asia Online. http://centralasiaonline.com/en_GB/articles/caii/features/pakistan/2010/06/18/feature-01. Retrieved 5 December 2012. ↑ Hali, S.M (March 7, 2012). "Economic Terrorism". http://www.nation.com.pk/pakistan-news-newspaper-daily-english-online/columns/07-Mar-2012/economic-terrorism. Retrieved 5 December 2012. ↑ "Obama unveils new US policy for Pakistan, Afghanistan". http://www.thenews.com.pk/blog/blog_details.asp?id=107. Retrieved July 2, 2009. ↑ "Obama to propose 28 billion dollars military aid for Pakistan". Thaindian.com. March 31, 2009. http://www.thaindian.com/newsportal/south-asia/obama-to-propose-28-billion-dollars-military-aid-for-pakistan_100173583.html. Retrieved March 27, 2011. ↑ Shalal-Esa, Andrea (March 2, 2010). "US to send Pakistan laser-guided bomb kits". Reuters. http://www.reuters.com/article/idUSN0217277420100302?type=marketsNews.